Our first Gallery shows the host nation preparing for Thursday's practice session. The Italian's prepare for the Thursday practice session. The Italian's prepare for the Thursday practice session. Andreas Fini waits patiently for the start, perhaps wondering what the future brings! It would be Andrea's first ever first day inclusion in the team, at this level, and he would not waste the opportunity! Andreas Fini waits patiently for the start, perhaps wondering what the future brings! It would be Andrea's first ever first day inclusion in the team, at this level, and he would not waste the opportunity! 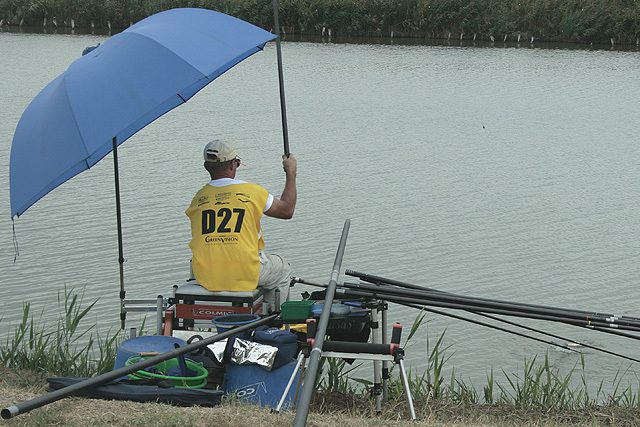 The 'Godfather' of Italian angling, Umberto Ballabeni, prepares to ball-in on Thursday practice session. 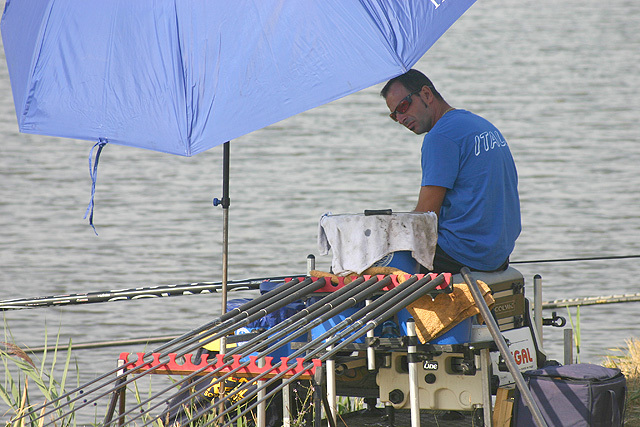 The 'Godfather' of Italian angling, Umberto Ballabeni, prepares to ball-in on Thursday practice session. An interesting technique raised during this tournament (not previously spotted by us before) was the use of some fine white powder (maybe chalk or potato flour???) to keep sweaty hands from sticking to the hot poles as they shipped out. An interesting technique raised during this tournament (not previously spotted by us before) was the use of some fine white powder (maybe chalk or potato flour???) to keep sweaty hands from sticking to the hot poles as they shipped out. A noticeable feature of Italy's cupping-in was the weight of the cups' contents! A noticeable feature of Italy's cupping-in was the weight of the cups' contents! 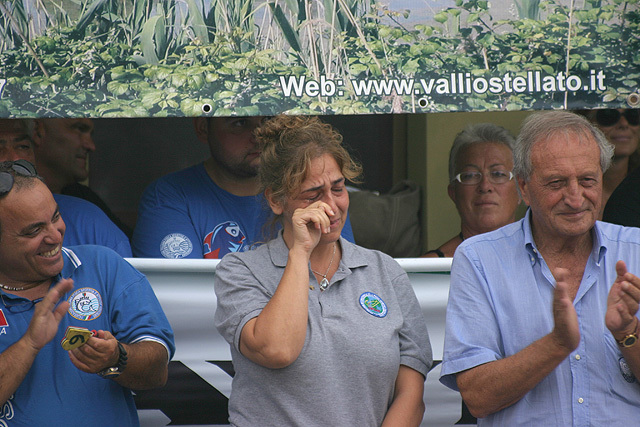 As both Umberto and Jacopo Falsini demonstrated! 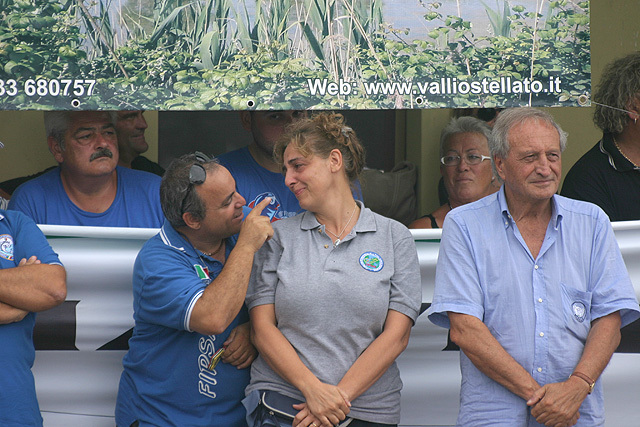 As both Umberto and Jacopo Falsini demonstrated! Jacopo's dirty hands pointed to a very heavy soil-based ball. Jacopo's dirty hands pointed to a very heavy soil-based ball. Gallery number two from Thurday's session is of general coverage, but focusses on some South Africans and Channel Islanders in the main. 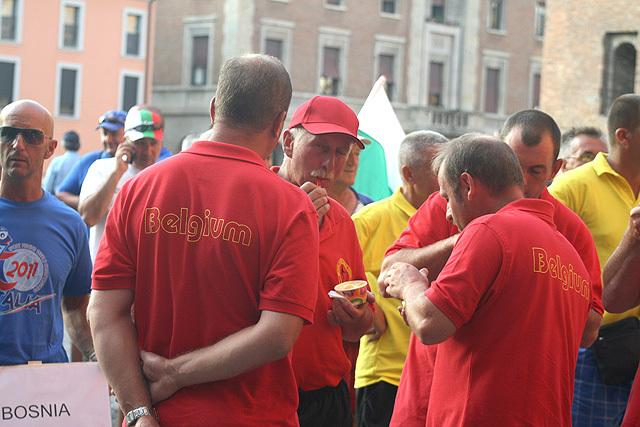 Another 'Godfather', this time belonging to Belgium, enjoys a cool ice-cream before the start of the opening ceremony in Ferrara! Another 'Godfather', this time belonging to Belgium, enjoys a cool ice-cream before the start of the opening ceremony in Ferrara! 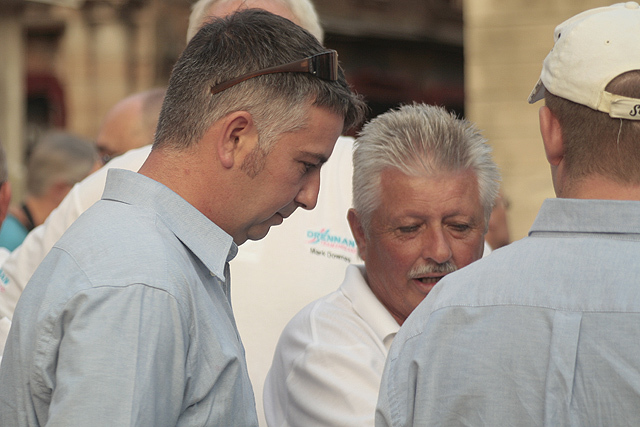 He's not really a Godfather yet, but he's working on it... Channel Islands manager Thierry Theaudin waits in line during the opening ceremony and presentations, held in the historic town of Ferrara. 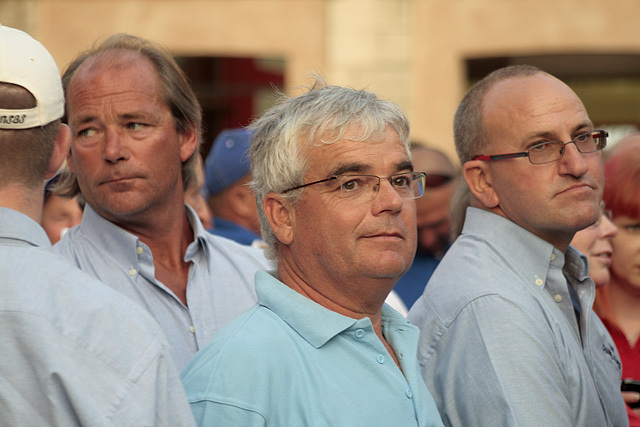 He's not really a Godfather yet, but he's working on it... Channel Islands manager Thierry Theaudin waits in line during the opening ceremony and presentations, held in the historic town of Ferrara. 'Islander' Garry Crisp about to net a small skimmer under the watchful, if not laid-back, eyes of team coach Patrick Weekers. I bet Garry wished he was back in Merida!!! 'Islander' Garry Crisp about to net a small skimmer under the watchful, if not laid-back, eyes of team coach Patrick Weekers. I bet Garry wished he was back in Merida!!! One of the 'Islanders' top rods, Greig Brown, looks as though he's chatting to England joint manager Mark Addy. Wonder if he's enquiring about any vacant positions in the squad? Better not let Thierry see this Greig!!! One of the 'Islanders' top rods, Greig Brown, looks as though he's chatting to England joint manager Mark Addy. Wonder if he's enquiring about any vacant positions in the squad? Better not let Thierry see this Greig!!! Frenchman Didier Delannoy chats with new boy Paolo Velour during practice. Perhaps we may see Paulo soon in French colours? Frenchman Didier Delannoy chats with new boy Paolo Velour during practice. Perhaps we may see Paulo soon in French colours? Looking more like a pair of masked Tuscan Raiders from 'Star Wars', two South Africans cover up from the intense heat... don't they have sun in South Africa? Looking more like a pair of masked Tuscan Raiders from 'Star Wars', two South Africans cover up from the intense heat... don't they have sun in South Africa? 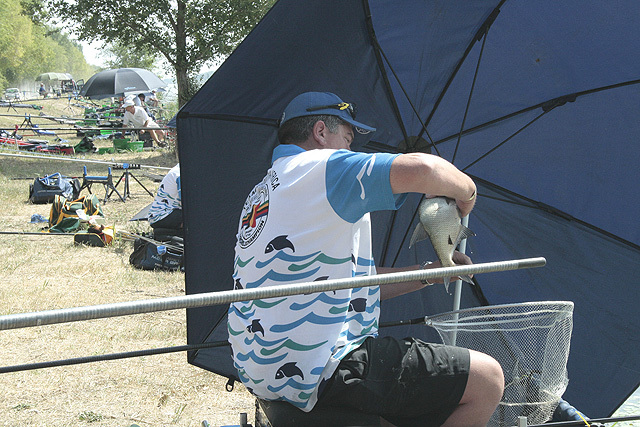 Here's one of our Tuscan Raiders close up, Eddie Francis as he brings in a good bream from Box 13, which just happened to be next to England's final practice box! 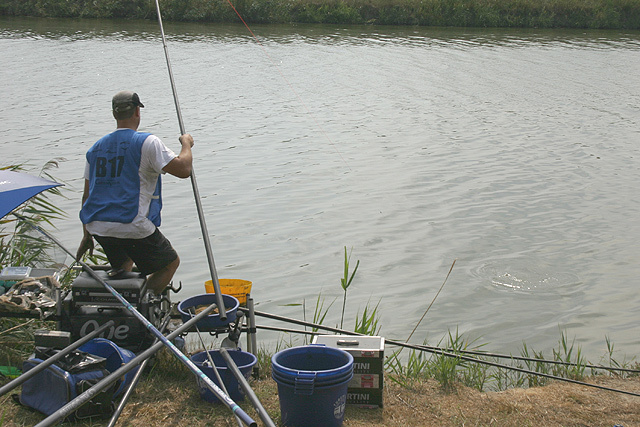 Here's one of our Tuscan Raiders close up, Eddie Francis as he brings in a good bream from Box 13, which just happened to be next to England's final practice box! 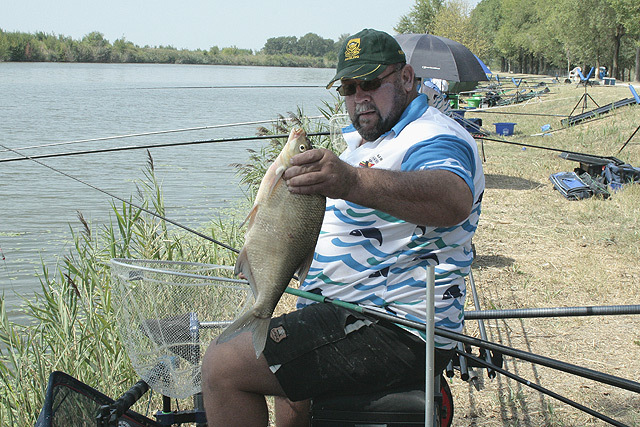 One of the Springboks new guys, Piet Bekker, with a good bream. Piet had clearly got the measure of his more illustrious neighbour to his left, Steve Gardener, as he weighed over 7 kilos by the end of practice. 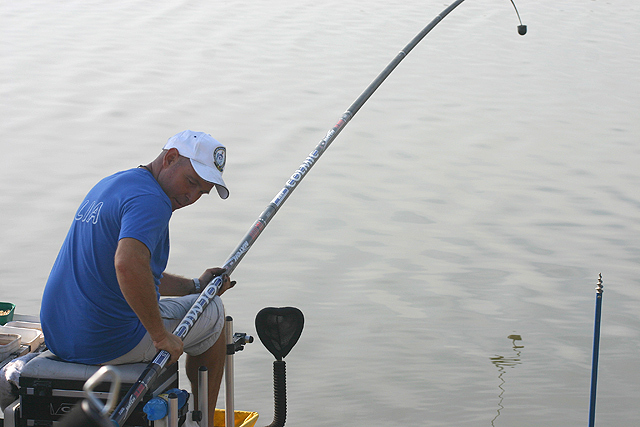 One of the Springboks new guys, Piet Bekker, with a good bream. Piet had clearly got the measure of his more illustrious neighbour to his left, Steve Gardener, as he weighed over 7 kilos by the end of practice. 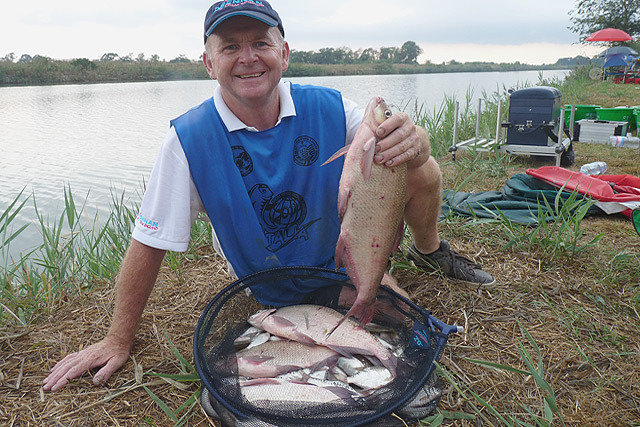 Another good fish for South Africa's Adrians Van Der Heever. Adrians would be the teams top points scorer with 7pts and a more than commendable 16th individual place overall. Another good fish for South Africa's Adrians Van Der Heever. Adrians would be the teams top points scorer with 7pts and a more than commendable 16th individual place overall. Who says the Springboks only catch carp? 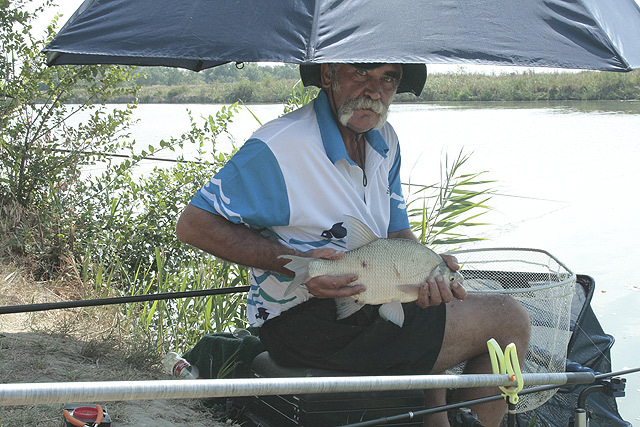 Robbie Liebenberg with another cracking bream. Robbie, like Adrians, was one of his teams best points scorers and helped contribute to an unbelievable and highly deserved 7th team placing. Keep it up guys! Who says the Springboks only catch carp? Robbie Liebenberg with another cracking bream. Robbie, like Adrians, was one of his teams best points scorers and helped contribute to an unbelievable and highly deserved 7th team placing. Keep it up guys! He does like holding up good fish... as well as the flag of St George... England's Stu Conroy is surely now becoming an indispensable part of the teams structure. He does like holding up good fish... as well as the flag of St George... England's Stu Conroy is surely now becoming an indispensable part of the teams structure. ...which turned out to be a carassio of just over a kilo. Alan was England's second top scorer, just edged out of first place by Stu on weight. ...which turned out to be a carassio of just over a kilo. Alan was England's second top scorer, just edged out of first place by Stu on weight. This short gallery is from Friday's final practice sessions looking at the French in particular. 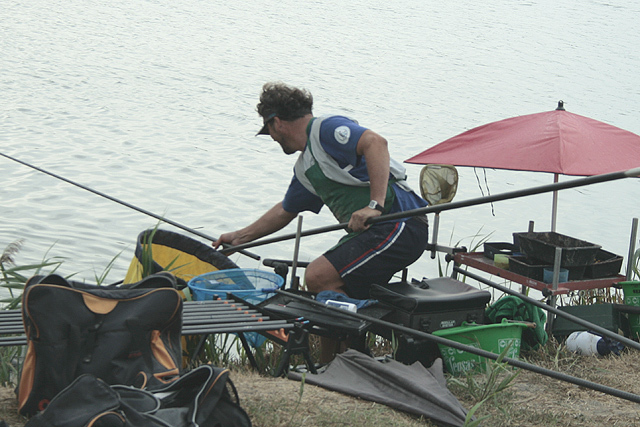 Paul-Louis Lafont, France's current European silver medallist, takes a small skimmer during final practice. Unlike Poland, Paul-Louis would have a tournament to forget! 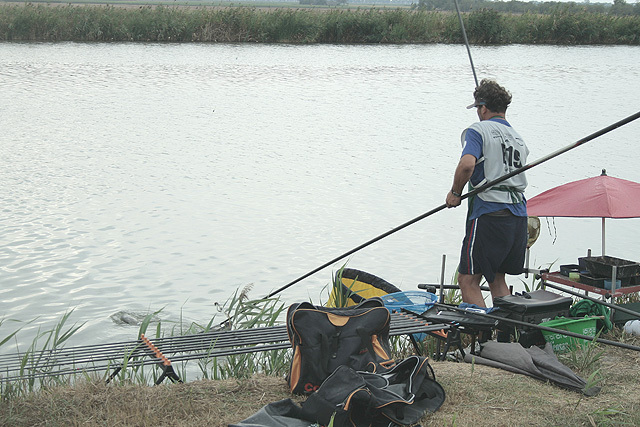 Paul-Louis Lafont, France's current European silver medallist, takes a small skimmer during final practice. Unlike Poland, Paul-Louis would have a tournament to forget! 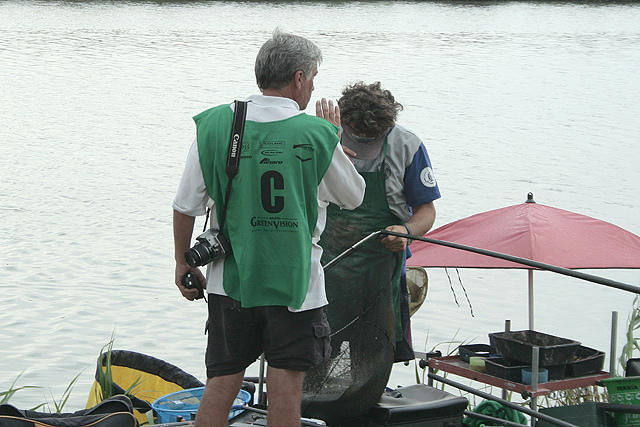 French team manager Jean-Pierre Misseri inspects some of the teams bloodworm as it goes through the sieve. How much of where the blame lies, for the country's appalling performance, will no doubt be again debated across the land, in stark contrast to the jubilation after Poland. It is a question that continues to remain...how can such a thing have happened? 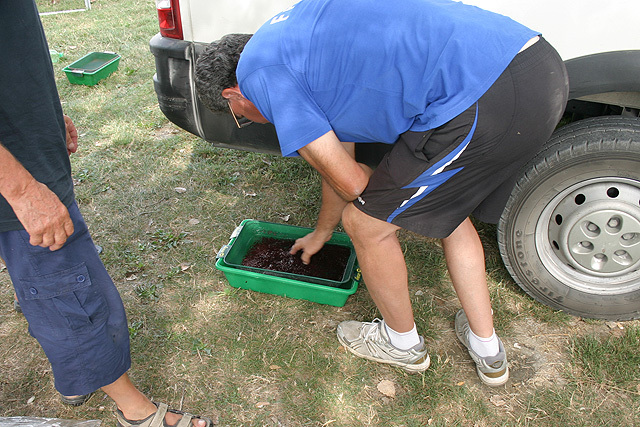 French team manager Jean-Pierre Misseri inspects some of the teams bloodworm as it goes through the sieve. How much of where the blame lies, for the country's appalling performance, will no doubt be again debated across the land, in stark contrast to the jubilation after Poland. It is a question that continues to remain...how can such a thing have happened? 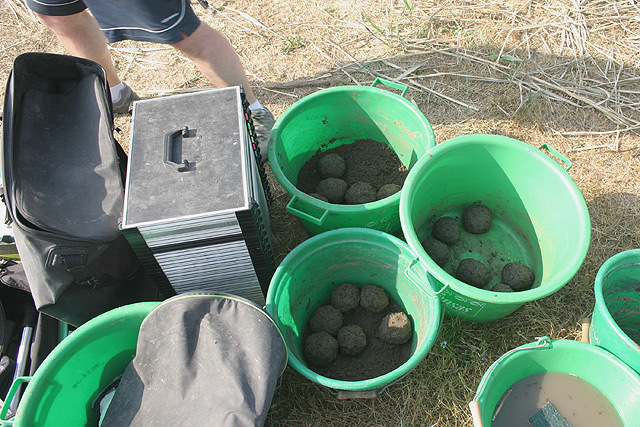 Jerome Vasseur's balls, which look to be heavy with soil and possibly two, or even three, mixes! Could it be that the French were relying on soil rather than groundbait??? Jerome Vasseur's balls, which look to be heavy with soil and possibly two, or even three, mixes! Could it be that the French were relying on soil rather than groundbait??? 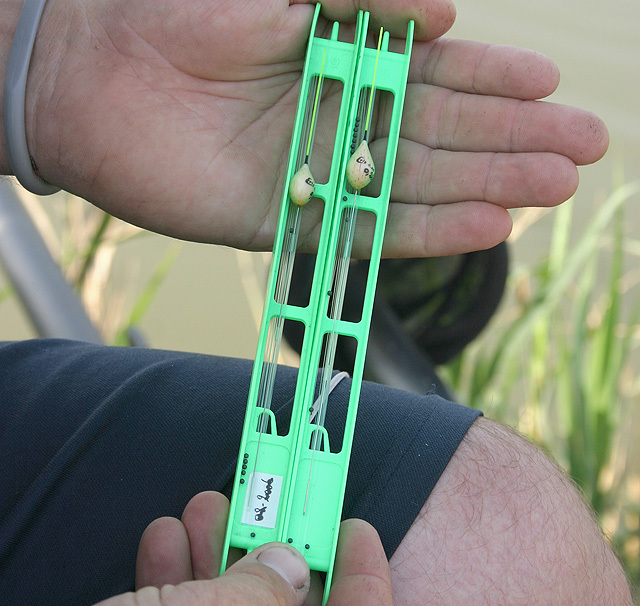 Jerome gives us a close-up of some of his rigs that were used on the canal, and they look pretty light to me! 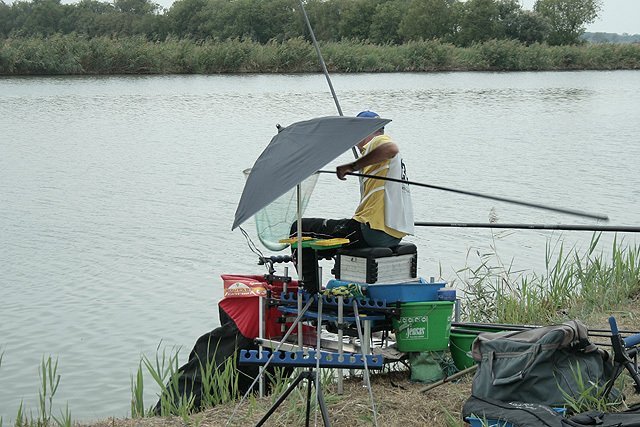 Jerome gives us a close-up of some of his rigs that were used on the canal, and they look pretty light to me! 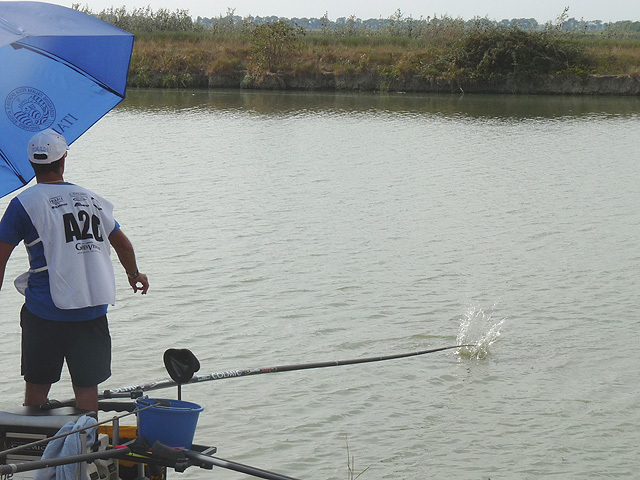 Here we have one of San Marino's anglers playing a good fish, which was lost shortly after. 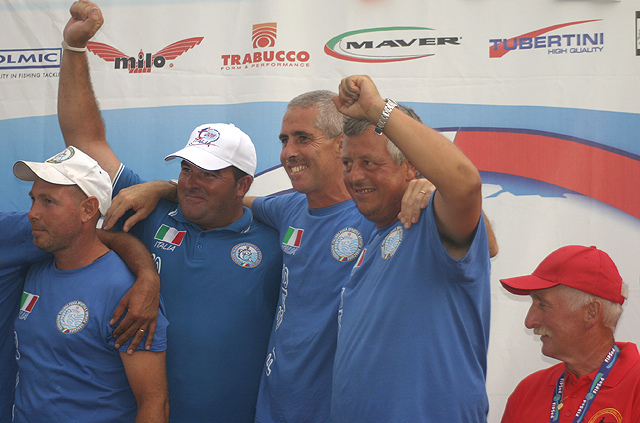 Often referred to (somewhat unkindly) as the Italian 'B' team, San Marino are no 'mugs' on home turf, as they showed at Spinadesco during the 2008 Championships. Even they finished in a creditable 8th plac,e with 78 points, I'm sure they fancied a much higher position, given there proximity to the venue! 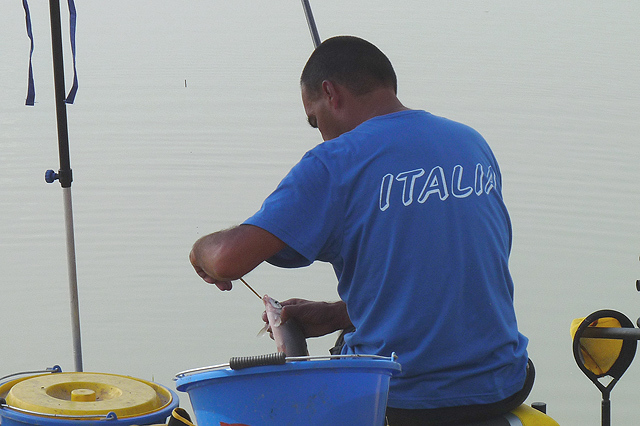 Here we have one of San Marino's anglers playing a good fish, which was lost shortly after. 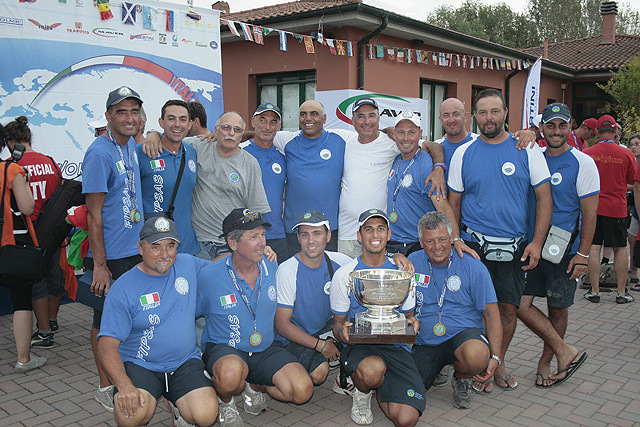 Often referred to (somewhat unkindly) as the Italian 'B' team, San Marino are no 'mugs' on home turf, as they showed at Spinadesco during the 2008 Championships. Even they finished in a creditable 8th plac,e with 78 points, I'm sure they fancied a much higher position, given there proximity to the venue! 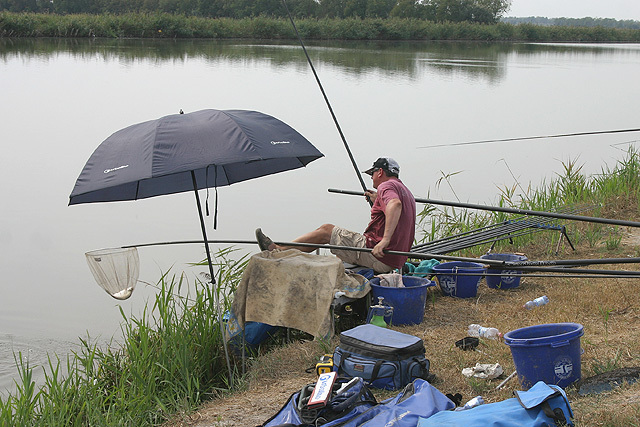 One of Belgium's most senior and experienced rods, Eric de Venti, nets a good skimmer with his usual 'foot-rest' netting technique! 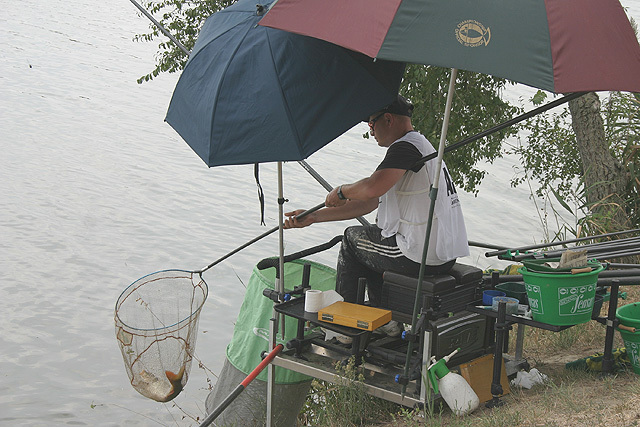 One of Belgium's most senior and experienced rods, Eric de Venti, nets a good skimmer with his usual 'foot-rest' netting technique! 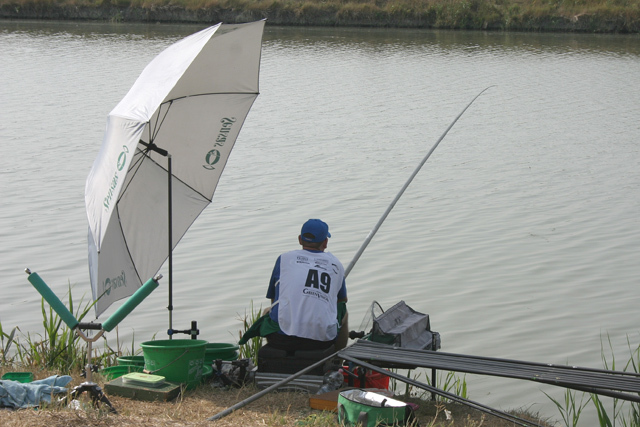 England's Stu Conroy latches into a good fish and would eventually have a brilliant tournament, proving his worth as one of the teams 'solid-rock's'. 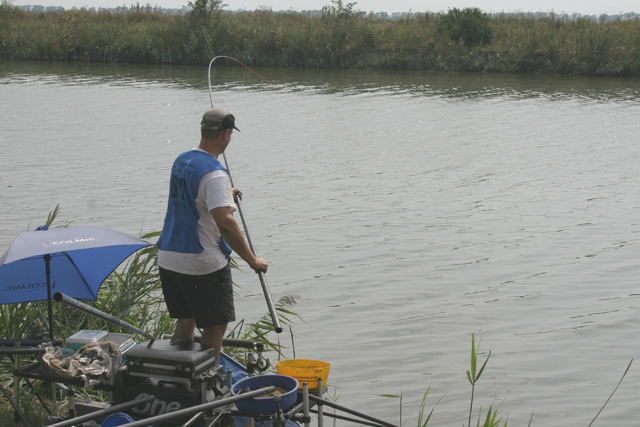 England's Stu Conroy latches into a good fish and would eventually have a brilliant tournament, proving his worth as one of the teams 'solid-rock's'. It's a good fish of about 3lb (just over a kilo). Stu kept putting in good performances throughout the practice sessions and matches, no doubt cementing his position within the squad with two fine displays, earning him England's 'Best Championship Performer' (on weight). It's a good fish of about 3lb (just over a kilo). Stu kept putting in good performances throughout the practice sessions and matches, no doubt cementing his position within the squad with two fine displays, earning him England's 'Best Championship Performer' (on weight). Our Saturday Galleries feature a limited selection from all the first day sections plus some individual ones of Mikael Tono and Andy Bertyn, which we thought would interest many of you... Enjoy! 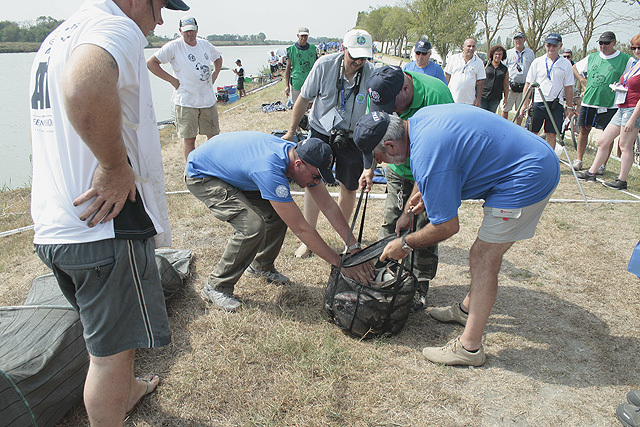 his final weigh-in, after some minor delays, recorded 25,580 kilos to set the Scotsman up for a possible second day podium place, unfortunately for Jamie his draw on day 2 couldn't carry him that far. his final weigh-in, after some minor delays, recorded 25,580 kilos to set the Scotsman up for a possible second day podium place, unfortunately for Jamie his draw on day 2 couldn't carry him that far. 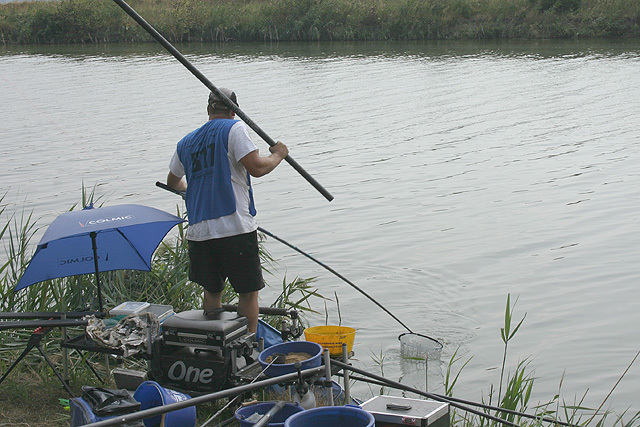 Stephane Pottelet strikes into a fish, but the Frenchman's problem, along with the rest of his team, was to catch enough to break into each sections top 5. It perhaps clearly points to how effective the teams overall strategy was in Italy when you realise that Stephane was his country's highest scorer on each day...and he finished with 13pts overall!!! 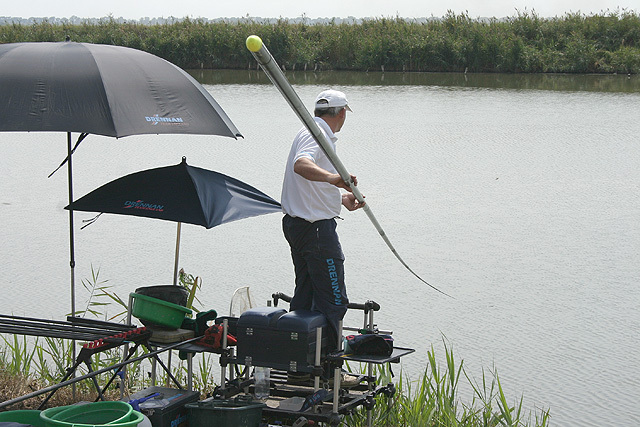 Stephane Pottelet strikes into a fish, but the Frenchman's problem, along with the rest of his team, was to catch enough to break into each sections top 5. It perhaps clearly points to how effective the teams overall strategy was in Italy when you realise that Stephane was his country's highest scorer on each day...and he finished with 13pts overall!!! Irishman Thomas Dowd safely nets a decent fish. Unfortunately all the bigger weights came from the early numbers and he could only finish in the bottom half of his sector. Ireland, after last years superb team and individual efforts, fielded an almost new look side in Italy, and they paid a heavy price. A stunning 4th team place and silver individual position was turned on its head and, sadly, this years contingent could not aspire to any position greater than 27th place. Irishman Thomas Dowd safely nets a decent fish. Unfortunately all the bigger weights came from the early numbers and he could only finish in the bottom half of his sector. Ireland, after last years superb team and individual efforts, fielded an almost new look side in Italy, and they paid a heavy price. A stunning 4th team place and silver individual position was turned on its head and, sadly, this years contingent could not aspire to any position greater than 27th place. Not always a safe option when trying to land a large fish, but our perky young Croatian, Ante Klanac, takes a step upwards, but to no avail. 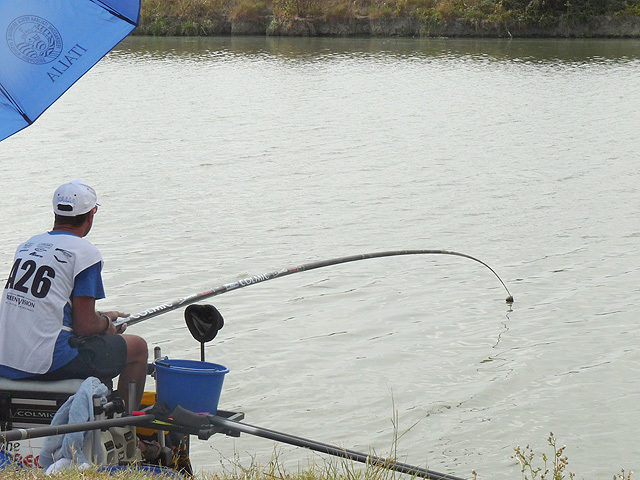 He landed the fish, a catfish of around 2 kilos, which was regretably ineligible! Not always a safe option when trying to land a large fish, but our perky young Croatian, Ante Klanac, takes a step upwards, but to no avail. He landed the fish, a catfish of around 2 kilos, which was regretably ineligible! but keeping his head in front was Holland's Jo Adriolo, who ultimately took the section with 13,890kgs. but keeping his head in front was Holland's Jo Adriolo, who ultimately took the section with 13,890kgs. Des nevertheless kept up the pressure on both to finish in 4th place with 10,850kgs. Des nevertheless kept up the pressure on both to finish in 4th place with 10,850kgs. 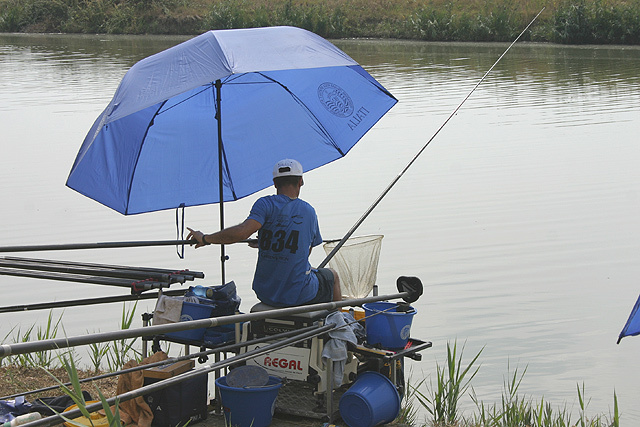 Another competitors makes use of the extra elevation by standing on his seatbox to play a fish, this time a Russian... Ilya Yakushin. But will he need that larger net, back down on firm ground? 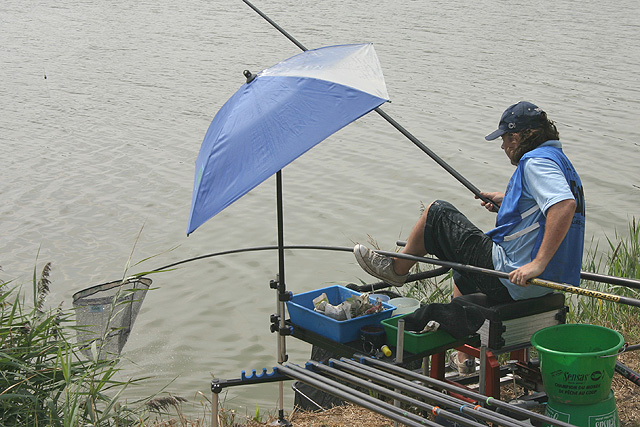 Another competitors makes use of the extra elevation by standing on his seatbox to play a fish, this time a Russian... Ilya Yakushin. But will he need that larger net, back down on firm ground? No, it looks as though Ilya has got it in the bag, or net! He went on to record 9,170kgs and a 6th in sector, courtesy of this quality carrassio. No, it looks as though Ilya has got it in the bag, or net! He went on to record 9,170kgs and a 6th in sector, courtesy of this quality carrassio. Mikael Tono has some problems getting this fish in! which takes him off his seatbox! which takes him off his seatbox! and it's not the suspected carp but a fair-sized bream which seemingly put up the fight of its life! and it's not the suspected carp but a fair-sized bream which seemingly put up the fight of its life! However all was revealed on closer inspection when it was found that the fish was foul-hooked... never mind, fair or foul-hooked they all count Mikael! However all was revealed on closer inspection when it was found that the fish was foul-hooked... never mind, fair or foul-hooked they all count Mikael! 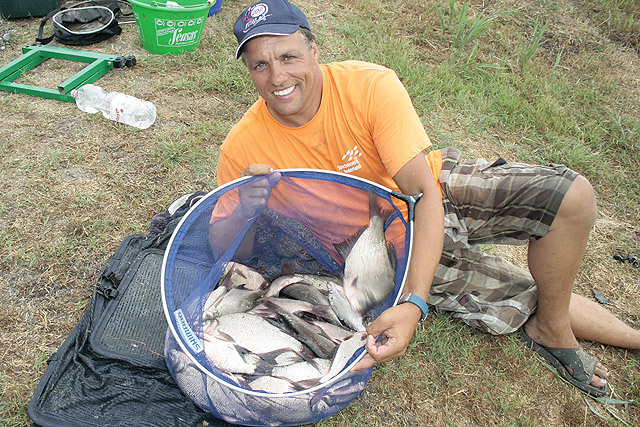 Channel Islander master chef, Shaun Rankin, gets stuck into the skimmers and bream and finishes with 9.050kgs for a second in sector. 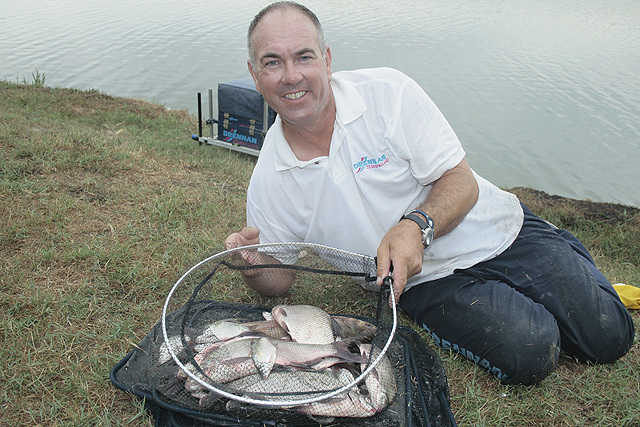 Channel Islander master chef, Shaun Rankin, gets stuck into the skimmers and bream and finishes with 9.050kgs for a second in sector. Springbok Adrians Van Der Heever has one of the canal's lumps on. Springbok Adrians Van Der Heever has one of the canal's lumps on. and eventually nets it... but then he hits a problem! and eventually nets it... but then he hits a problem! 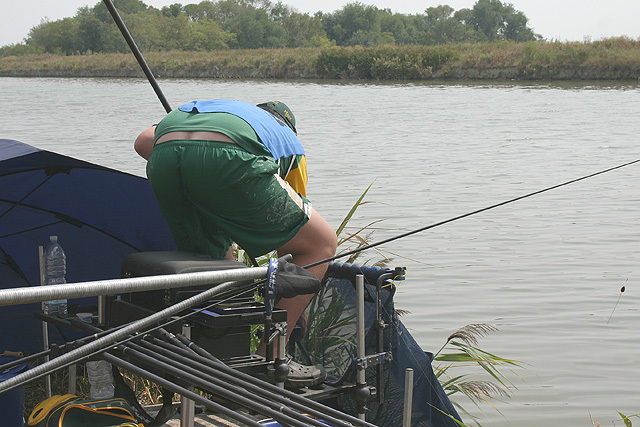 His peg is quite high up off the waterline so he has to bend down to start to heave it safely up. It's at this point that something goes wrong with the net (I said it was a lump!) and the fish drops back into the canal. It's a good job he had 2 others which secured for him the sector! 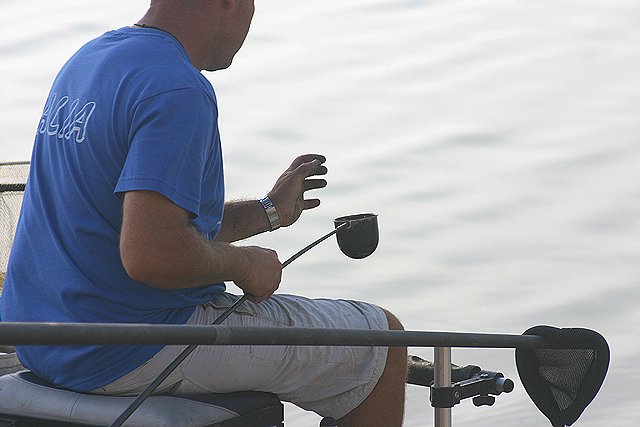 His peg is quite high up off the waterline so he has to bend down to start to heave it safely up. It's at this point that something goes wrong with the net (I said it was a lump!) and the fish drops back into the canal. It's a good job he had 2 others which secured for him the sector! 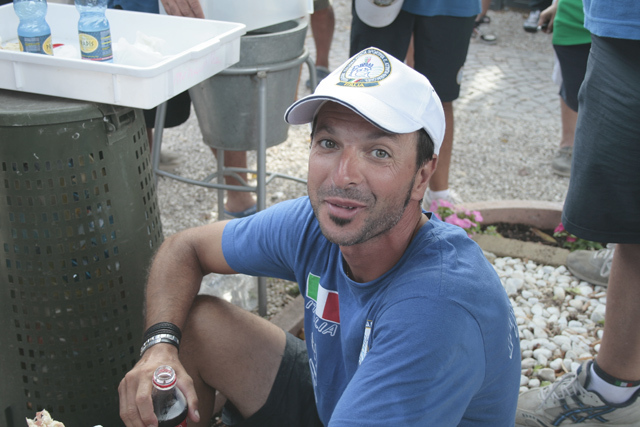 Italy's Andrea Fini gets amongst the fish early on in B sector to start building a lead of his English rival, Stu Conroy just 2 pegs away. Italy's Andrea Fini gets amongst the fish early on in B sector to start building a lead of his English rival, Stu Conroy just 2 pegs away. In between them is Welshman Nigel Evans, who looks to be keeping a close eye on Andrea. In between them is Welshman Nigel Evans, who looks to be keeping a close eye on Andrea. Meanwhile, Stu Conroy has the added benefit, or maybe the disadvantage, of one of his managers behind him! Meanwhile, Stu Conroy has the added benefit, or maybe the disadvantage, of one of his managers behind him! At the end of the day, Andrea needs a little help, from an Italian partisan, to lift his net up to the scales! At the end of the day, Andrea needs a little help, from an Italian partisan, to lift his net up to the scales! Belgium's Andy Bertyn was running out of time with this 'lump'! and Belgium's Andy Bertyn has latched into one of them. and Belgium's Andy Bertyn has latched into one of them. and it looked as though this fight would go to the wire. and it looked as though this fight would go to the wire. now and then. now and then. It looked at one point that Andy was going to finally net the fish, as time was rapidly running out! With just several minutes left before the final 'all-out' signal, Andy seemed no nearer to landing the beast. It looked at one point that Andy was going to finally net the fish, as time was rapidly running out! With just several minutes left before the final 'all-out' signal, Andy seemed no nearer to landing the beast. As many know, you must have the fish clear of the water when the final signal is sounded otherwise the fish is not counted. 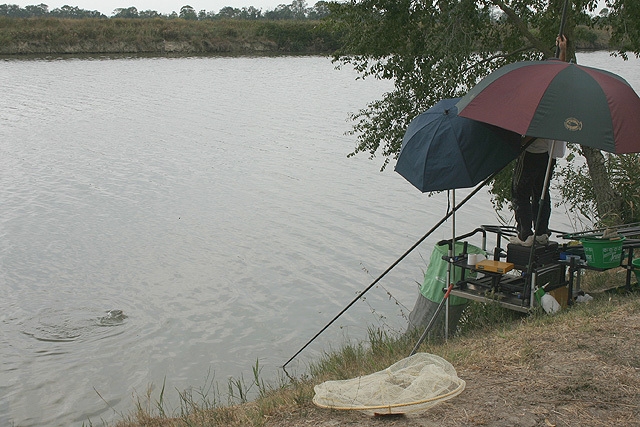 The worrying part that I could see was that Andy net seemed far too small for the fish. As many know, you must have the fish clear of the water when the final signal is sounded otherwise the fish is not counted. The worrying part that I could see was that Andy net seemed far too small for the fish. 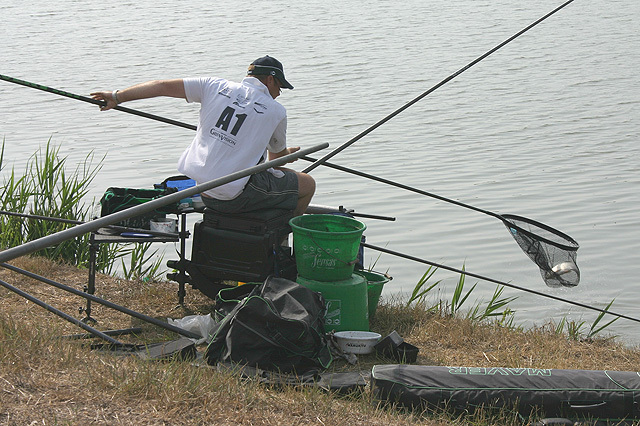 What happened shortly after this series of shots was taken was that Andy, with just one minute left, stood on his seatbox to gain more pressure and as he tried to lift the fish higher towards the net, the hook pulled out and the fish swam off. The cost was an effective second in sector, because his lost fish had equalled out Adrians lost monster! 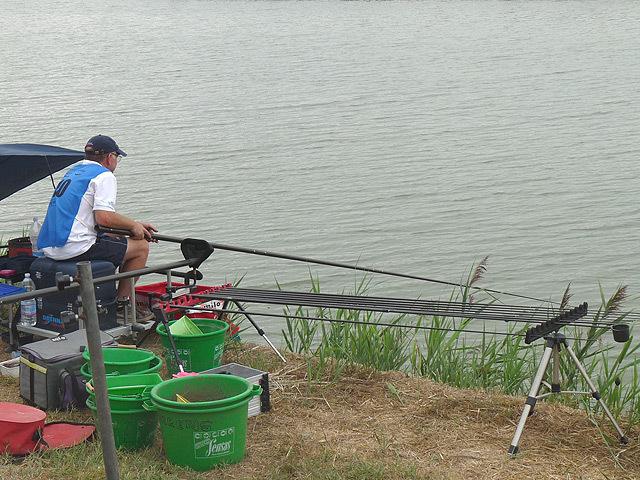 What happened shortly after this series of shots was taken was that Andy, with just one minute left, stood on his seatbox to gain more pressure and as he tried to lift the fish higher towards the net, the hook pulled out and the fish swam off. The cost was an effective second in sector, because his lost fish had equalled out Adrians lost monster! It was not a good tournament for Latvia's Rita Verza-Grabovska, despite the initial smiles before day one. It was not a good tournament for Latvia's Rita Verza-Grabovska, despite the initial smiles before day one. 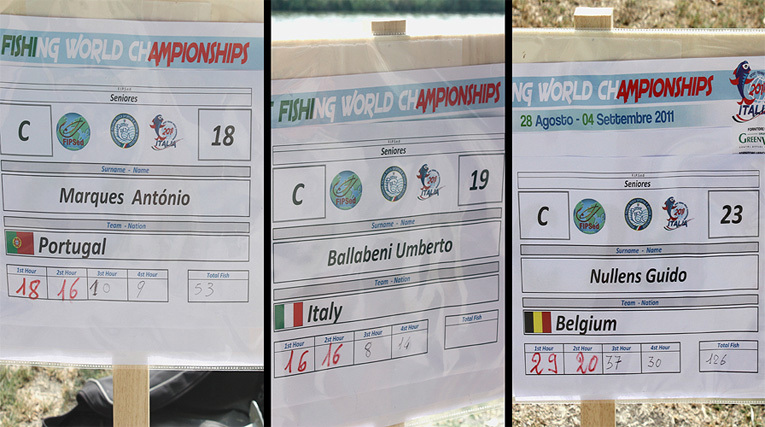 Three weigh boards, which highlight a teams biggest problem... size of fish! 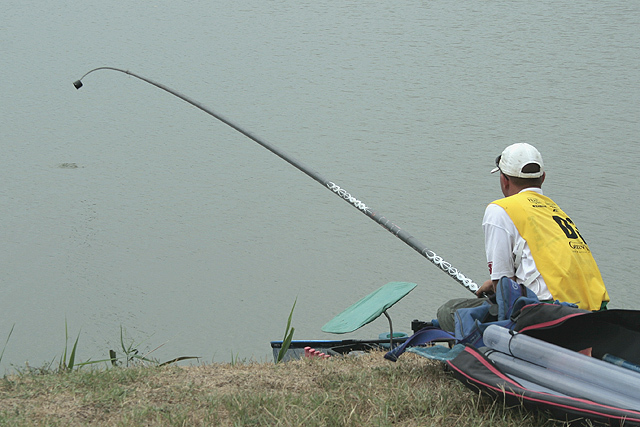 Three anglers close to each other, each with different weight results. 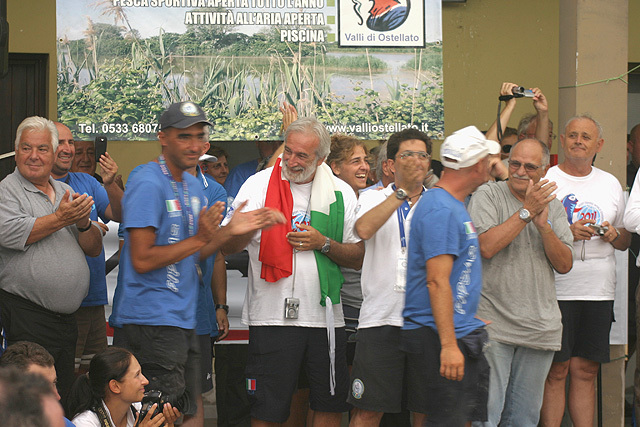 Portugal's Marques pegged next to Ballabeni had one fish less than the Italian, but there was nearly SIX KILOS difference at the weigh-in. 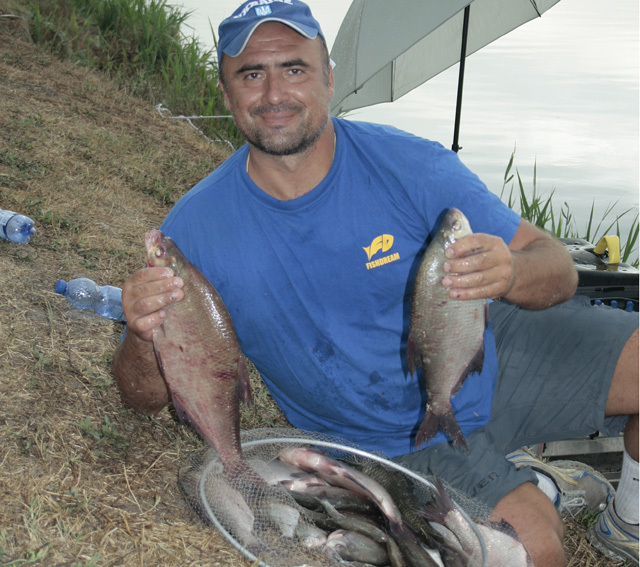 Belgium's Guido Nullens had double Ballabeni's fish count, but again nearly two and a half kilos separated them! Three weigh boards, which highlight a teams biggest problem... size of fish! 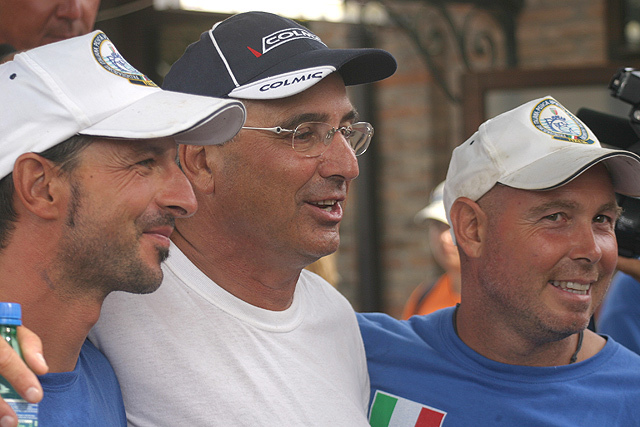 Three anglers close to each other, each with different weight results. 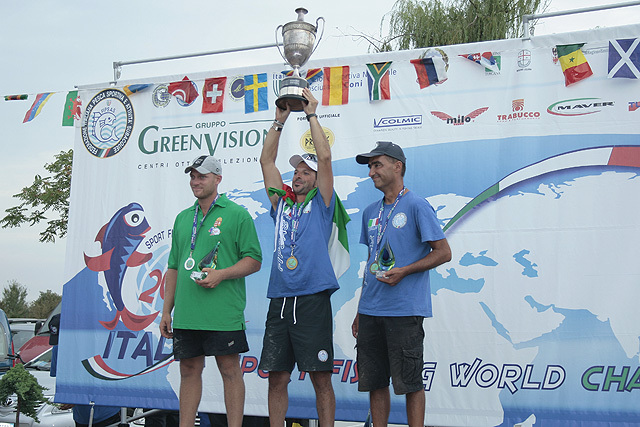 Portugal's Marques pegged next to Ballabeni had one fish less than the Italian, but there was nearly SIX KILOS difference at the weigh-in. 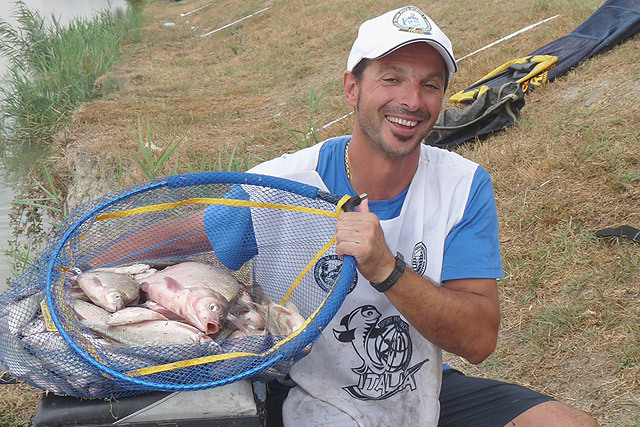 Belgium's Guido Nullens had double Ballabeni's fish count, but again nearly two and a half kilos separated them! In the lower part of D section, Italy's Ferruccio Gabba was powering ahead with quality skimmers like this. In the lower part of D section, Italy's Ferruccio Gabba was powering ahead with quality skimmers like this. 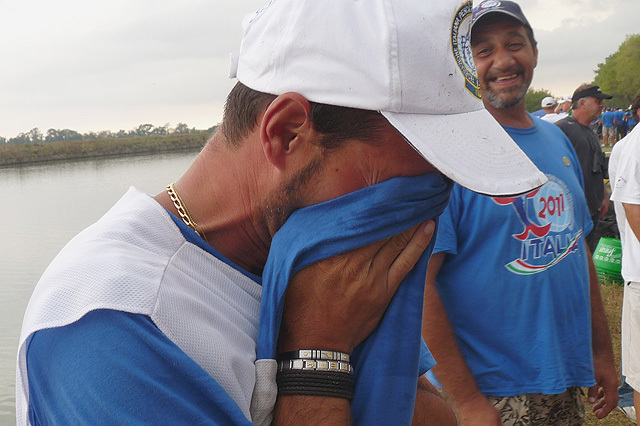 These better-sized fish gave Ferrucio the edge over all other in his sector as his fish-count clearly showed. 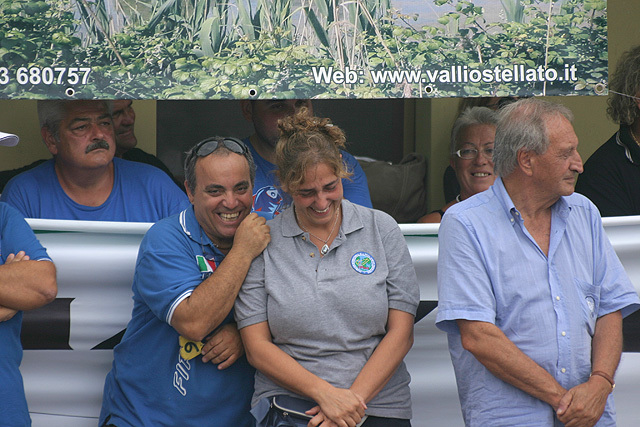 For instance, next best weight in sector with 9.060kgs was Germany's Claus Muller...and he had exactly the same number of fish as Ferruccio, but the Italian weighed in over five and a half kilos more! 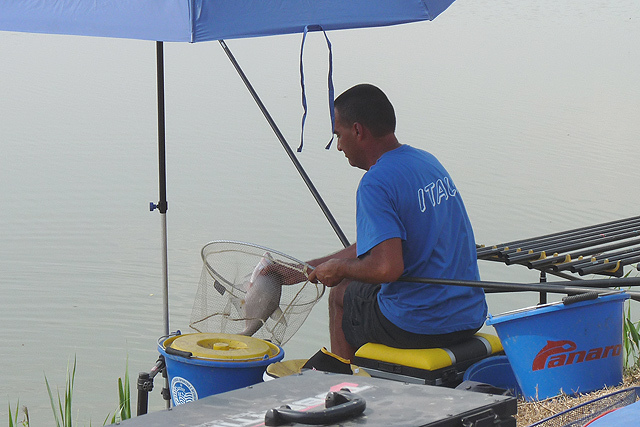 These better-sized fish gave Ferrucio the edge over all other in his sector as his fish-count clearly showed. 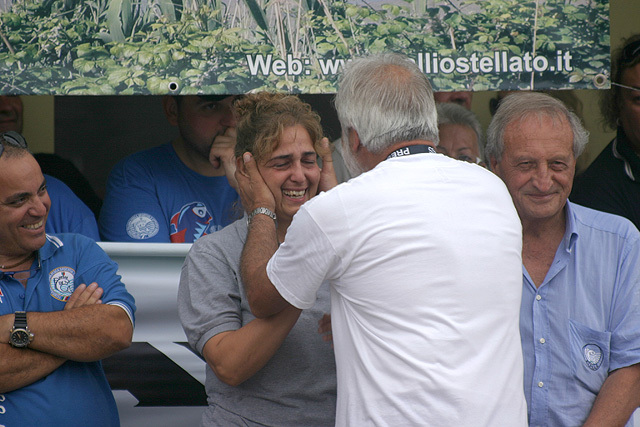 For instance, next best weight in sector with 9.060kgs was Germany's Claus Muller...and he had exactly the same number of fish as Ferruccio, but the Italian weighed in over five and a half kilos more! Swiss competitor Georges Weidner takes a small skimmer on D28, and could only finish half way down his sector. Swiss competitor Georges Weidner takes a small skimmer on D28, and could only finish half way down his sector. Even World Champs, and a five times one at that, can lose fish! Alan Scotthorne on D29 is visibly 'peeved' at bumping a skimmer. 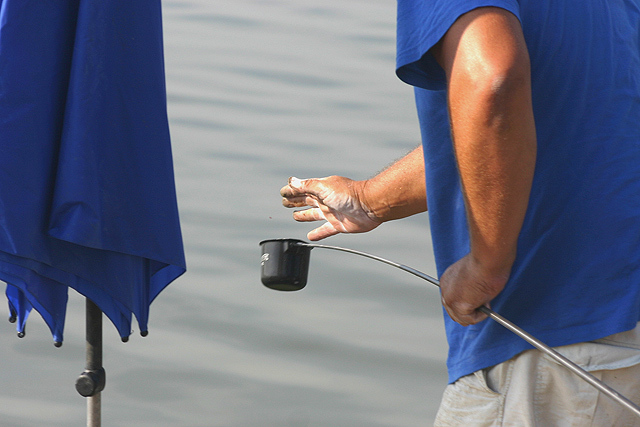 Even World Champs, and a five times one at that, can lose fish! Alan Scotthorne on D29 is visibly 'peeved' at bumping a skimmer. To make it worse, he has to clean all the 'snot' off the line as well!!! To make it worse, he has to clean all the 'snot' off the line as well!!! In lower E sector, England's Will Raison waits for the signal to signify the start of pre-baiting. In lower E sector, England's Will Raison waits for the signal to signify the start of pre-baiting. 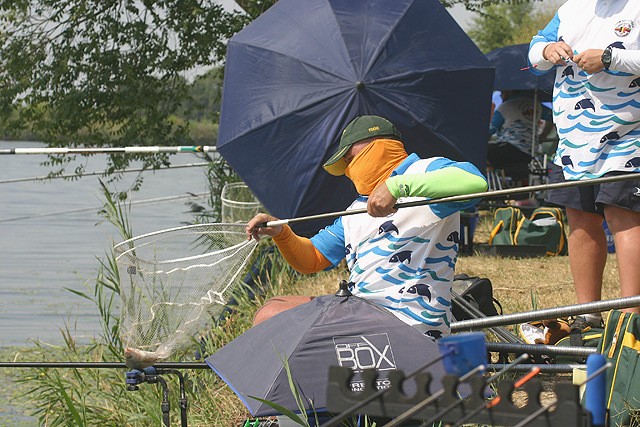 Poland's Zbigniew Milewski found himself in a close peg-for-peg battle with his Italian neighbour, Stefano Defendi, and was beaten once more by the size of fish, even though he looks to have a good net of them here! 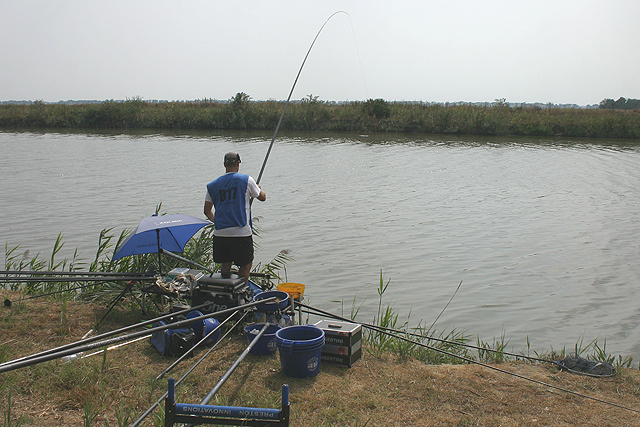 Poland's Zbigniew Milewski found himself in a close peg-for-peg battle with his Italian neighbour, Stefano Defendi, and was beaten once more by the size of fish, even though he looks to have a good net of them here! Defendi was obviously pleased with his catch, which gave him 3rd in sector. He probably wasn't so happy when he found that his 3pts gave him a pair of running shoes for day two, as he made way for Gianluigi Sorti! Defendi was obviously pleased with his catch, which gave him 3rd in sector. He probably wasn't so happy when he found that his 3pts gave him a pair of running shoes for day two, as he made way for Gianluigi Sorti! 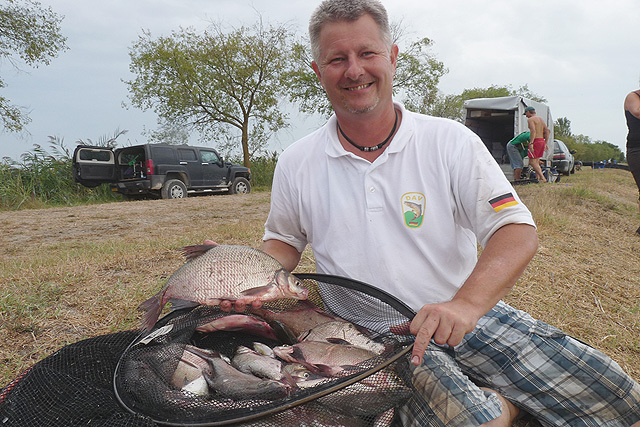 The sectors ultimate winner, smiling Dutchman Deiter Friederichs, with a 12.150kg haul. The sectors ultimate winner, smiling Dutchman Deiter Friederichs, with a 12.150kg haul. 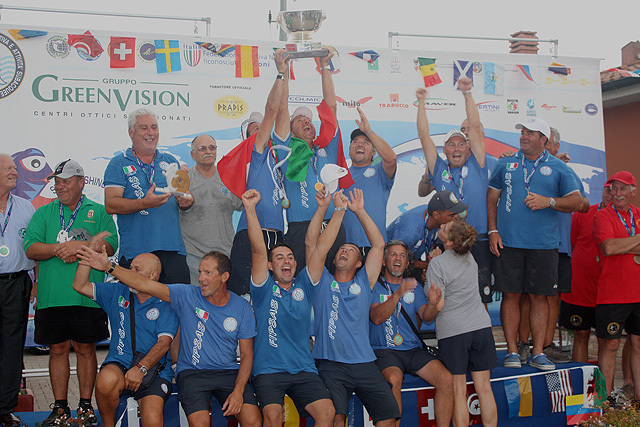 The following galleries bring to an end our coverage of this year's Nations Championship in Italy. We hope you have enjoyed our coverage, especially our extensive videos, which we felt were an adequate replacement for the normal articles. There are more extra interviews and features contained in the DVD of the event, which you will find fascinating. Just follow this link...CLICK. 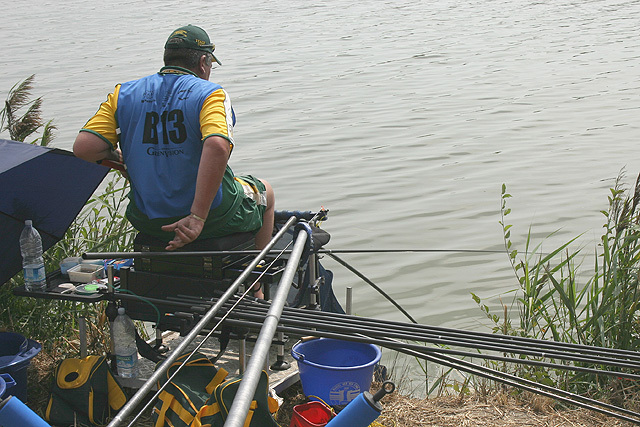 It looks as though Germany's Claus Muller is falling asleep waiting for the bait check! 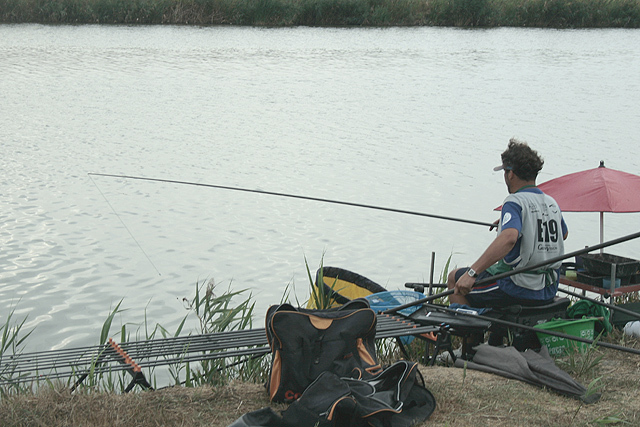 It looks as though Germany's Claus Muller is falling asleep waiting for the bait check! Andrea Fini prepares the 'cannonballs' for balling-in... could that be caster I see in those balls!!!! Andrea Fini prepares the 'cannonballs' for balling-in... could that be caster I see in those balls!!!! and it looks as though that one hit the target spot on! 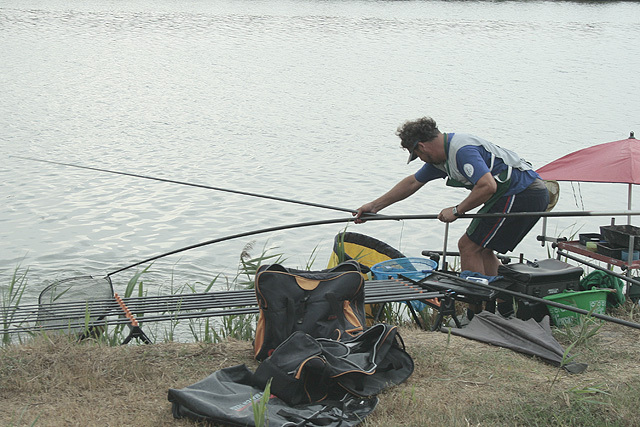 Andrea was fishing the same peg as his team mate Falsini did on day one, so he must have been confident with all that knowledge Jacopo gave him! and it looks as though that one hit the target spot on! 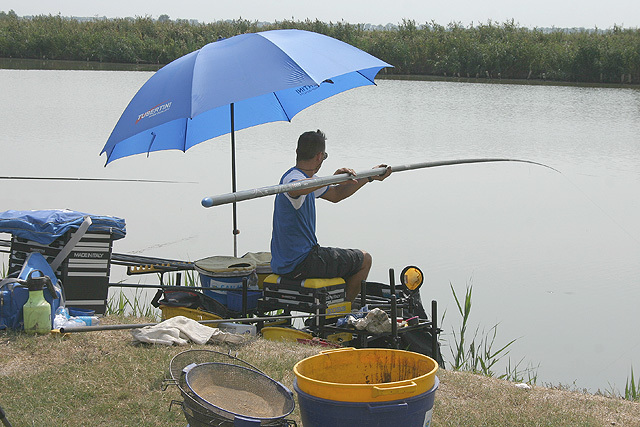 Andrea was fishing the same peg as his team mate Falsini did on day one, so he must have been confident with all that knowledge Jacopo gave him! His cupping-in was equally aggressive with nearly 20 balls of heavy feed going directly on top of the first wave of feed balls, something of a change from the Italians previous feeding strategy. His cupping-in was equally aggressive with nearly 20 balls of heavy feed going directly on top of the first wave of feed balls, something of a change from the Italians previous feeding strategy. 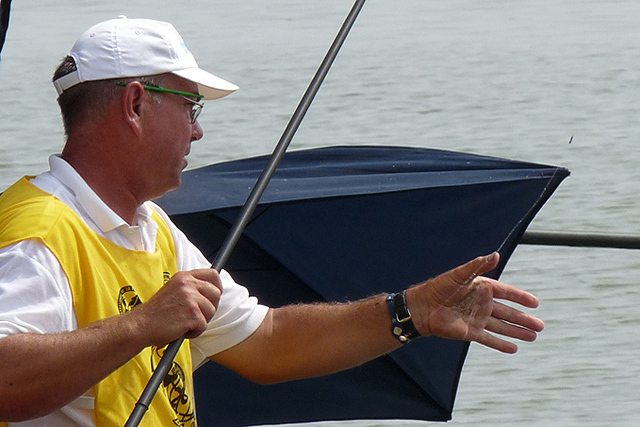 England's technical master Steve Gardener finally got the chance to fish on day two, at the expense of Sean Ashby. Steve put in a solid display in what turned out to be a tight race for the section.With the top five finishers all recording weights within one and a quarter kilos, Steve managed to secure 4th place, just 850 grams off the sector winner, Ewan Weed of Scotland. 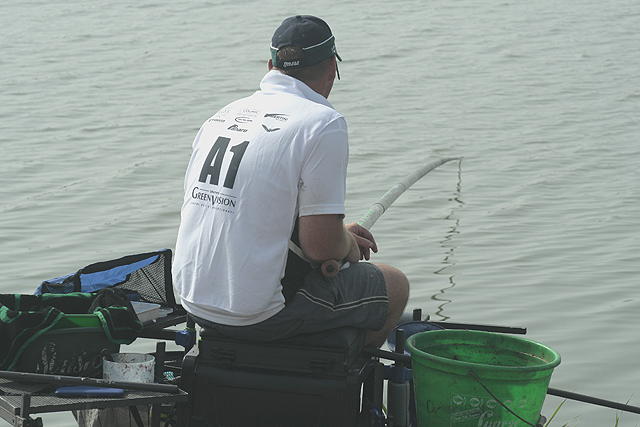 England's technical master Steve Gardener finally got the chance to fish on day two, at the expense of Sean Ashby. Steve put in a solid display in what turned out to be a tight race for the section.With the top five finishers all recording weights within one and a quarter kilos, Steve managed to secure 4th place, just 850 grams off the sector winner, Ewan Weed of Scotland. 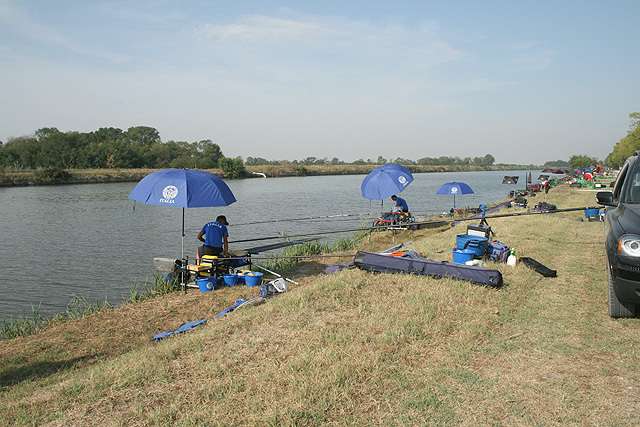 The 2 weigh-boards start to show the disadvantage of not being able to keep fish coming throughout the 4 hours of competition. 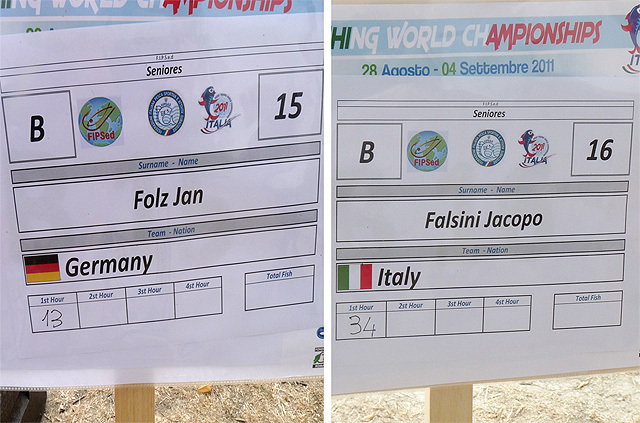 Germany's young hopeful Jan Folz was drawn next to the mighty Jacopo Falsini and posted a first hour return less than half of his illustrious neighbour. 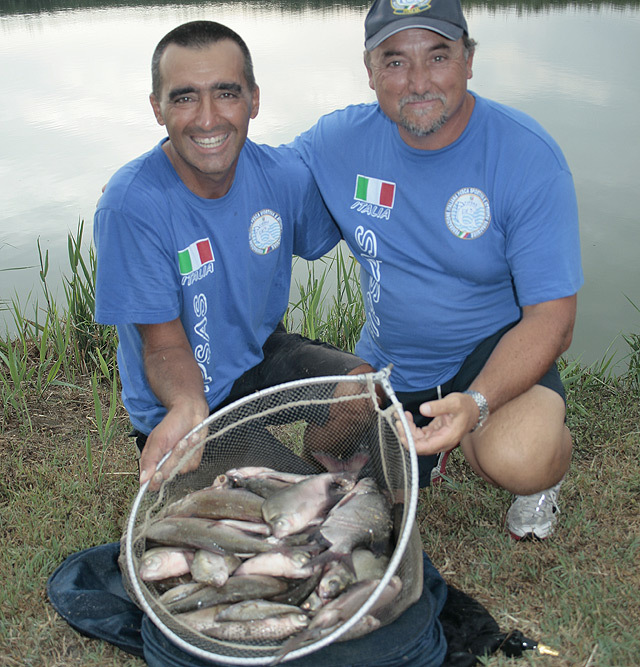 When you check the final fish count, after 4 hours of what turned out to be diminishing sport, you see that that Jan only caught 31 fish (nearly double his first hours return) to Jacopo's 95 fish overall! 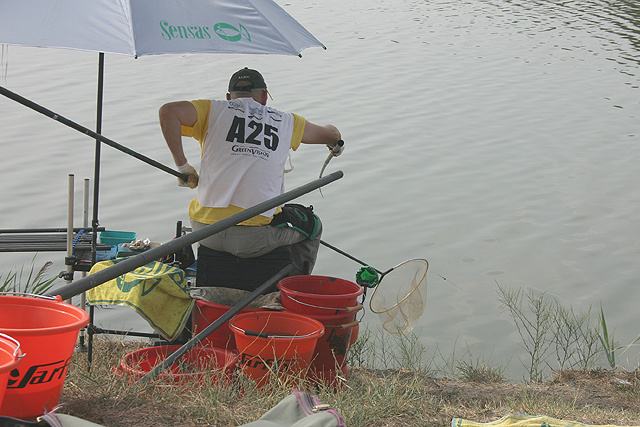 The 2 weigh-boards start to show the disadvantage of not being able to keep fish coming throughout the 4 hours of competition. Germany's young hopeful Jan Folz was drawn next to the mighty Jacopo Falsini and posted a first hour return less than half of his illustrious neighbour. When you check the final fish count, after 4 hours of what turned out to be diminishing sport, you see that that Jan only caught 31 fish (nearly double his first hours return) to Jacopo's 95 fish overall! Not quite as productive as day one for Germany's Claus Muller, but still 8pts for his team from A18. Not quite as productive as day one for Germany's Claus Muller, but still 8pts for his team from A18. 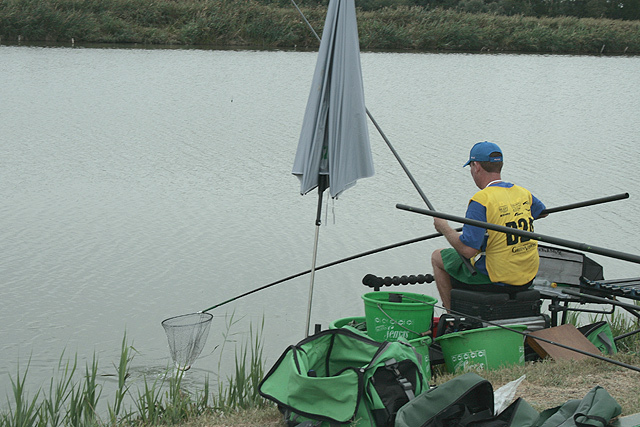 England's Stu Conroy on A21, with 11,710kgs for 3pts in his sector, just 800 grams away from a sector win. 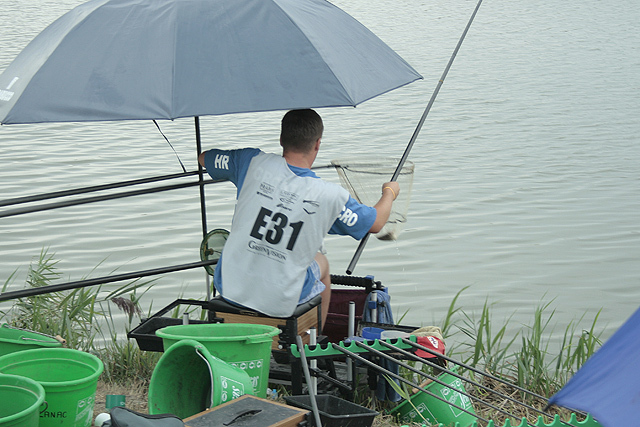 England's Stu Conroy on A21, with 11,710kgs for 3pts in his sector, just 800 grams away from a sector win. 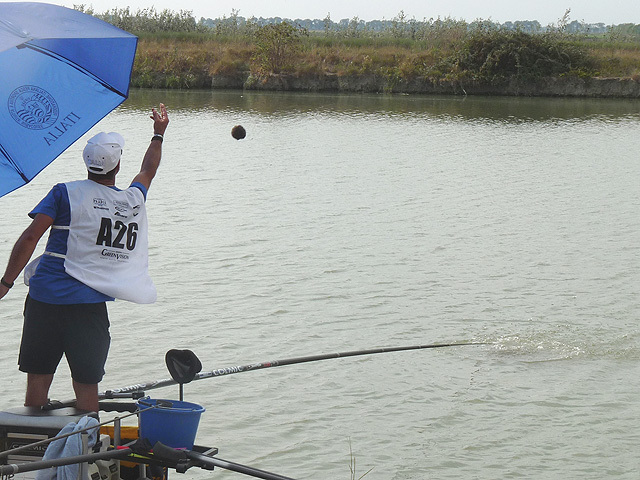 Andrea Fini displays the look of a new World Champion, and this catch of a lifetime from A26, which gave him that look! 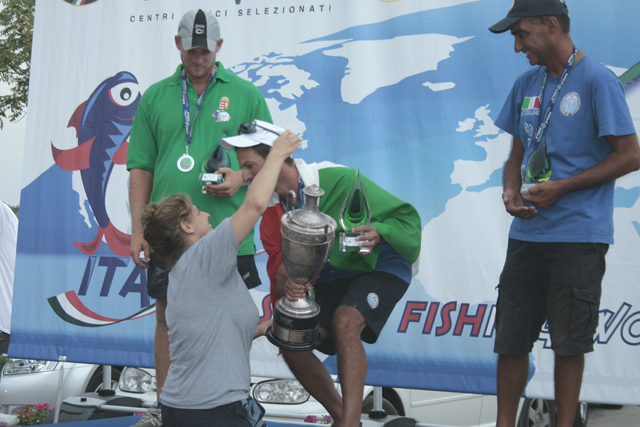 Andrea Fini displays the look of a new World Champion, and this catch of a lifetime from A26, which gave him that look! 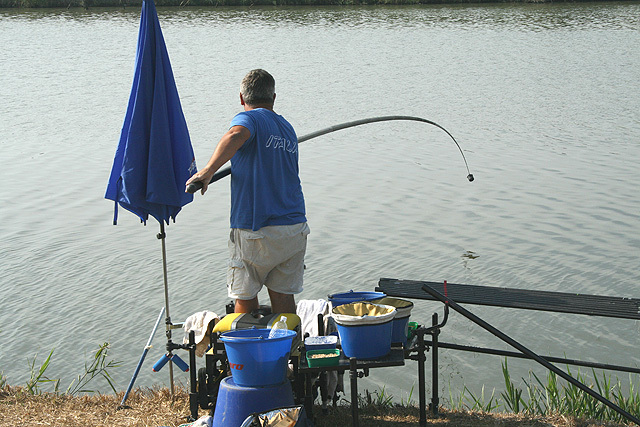 Steve Gardener's on B10 recorded a solid 8,720kgs in a tight finishing sector. 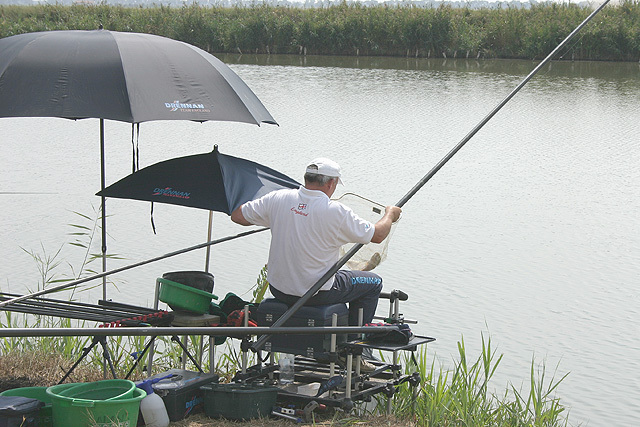 Steve Gardener's on B10 recorded a solid 8,720kgs in a tight finishing sector. 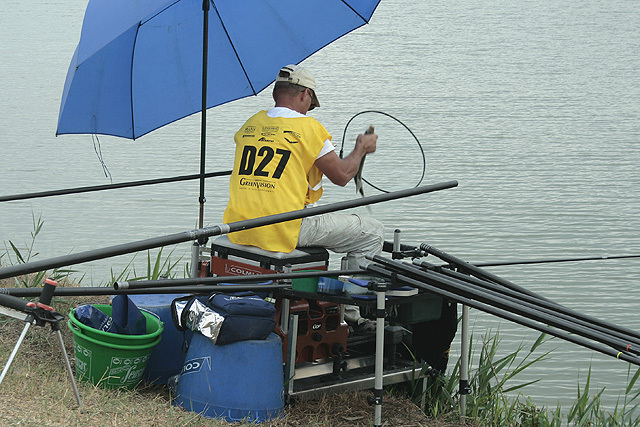 Holland's Bert Aufderhaar (B17) was sitting with 1pt before the final day's competition. 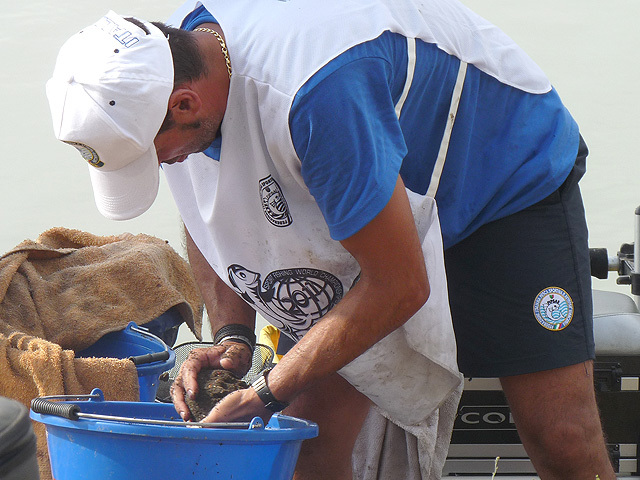 Unfortunately for Bert, this 8,300kgs catch for 5th in sector, didn't put him on the podium! 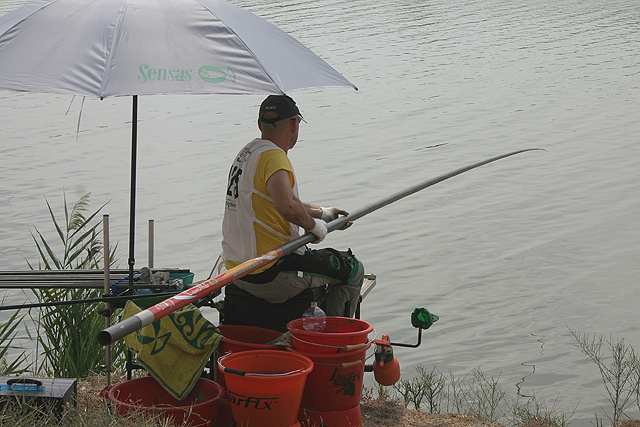 Holland's Bert Aufderhaar (B17) was sitting with 1pt before the final day's competition. 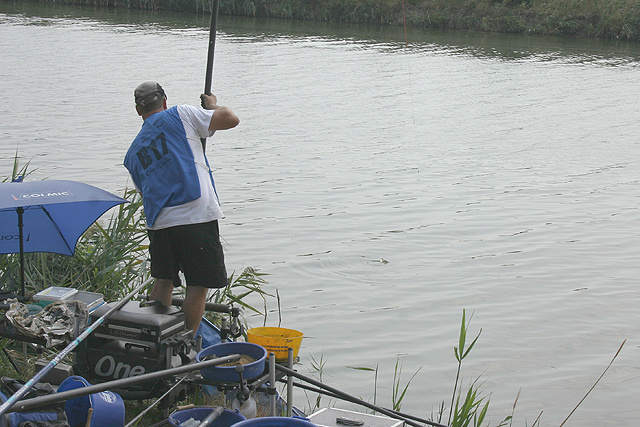 Unfortunately for Bert, this 8,300kgs catch for 5th in sector, didn't put him on the podium! Gianluigi Sorti nearly snatched the sector from Dutchman Andy Bertyn, with this 17,380kgs haul from C2. Gianluigi Sorti nearly snatched the sector from Dutchman Andy Bertyn, with this 17,380kgs haul from C2. Perhaps one of Germany's fresh faces of the future? 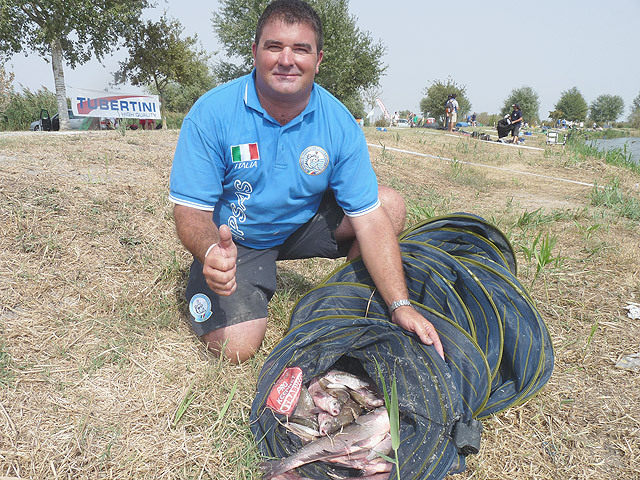 Young Chris Dobmeier with a well earned 3pts for his team with 5,070kgs of skimmers and bream from C25. Perhaps one of Germany's fresh faces of the future? 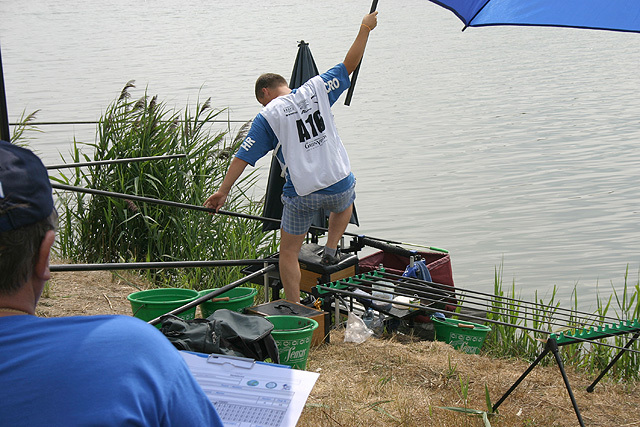 Young Chris Dobmeier with a well earned 3pts for his team with 5,070kgs of skimmers and bream from C25. Another sector win for Hungary's new star, Peter Milkovics on C34, but not enough total weight to take the gold medal, even though he recorded an overall 2pts like Fini! This 9,250 kilo haul was quite impressive when you consider that the peg only produced 1.235kgs the day before! Another sector win for Hungary's new star, Peter Milkovics on C34, but not enough total weight to take the gold medal, even though he recorded an overall 2pts like Fini! This 9,250 kilo haul was quite impressive when you consider that the peg only produced 1.235kgs the day before! D3 and the USA's Attila Agh cupping-in at the start of day 2. Attila improved from day one to earn 12pts on the final day. D3 and the USA's Attila Agh cupping-in at the start of day 2. Attila improved from day one to earn 12pts on the final day. 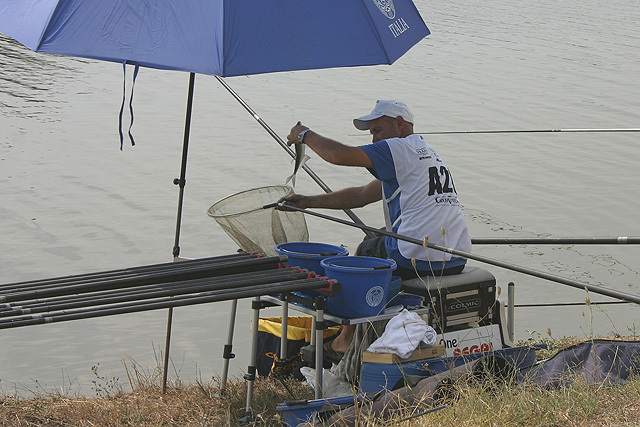 Croatia's Sinisa Veres strikes into a good fish on his way to 6,770kgs and 8 sector points form D13. 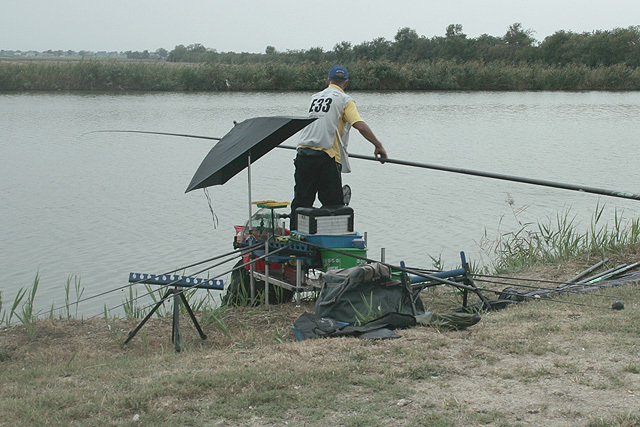 Croatia's Sinisa Veres strikes into a good fish on his way to 6,770kgs and 8 sector points form D13. 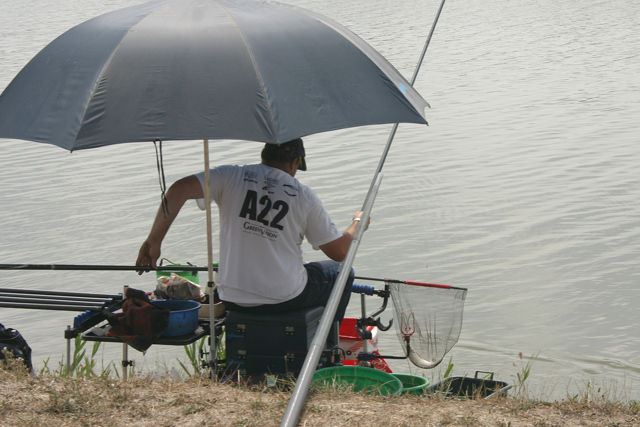 Frenchman Stephane Pottelet nets another small fish from D24. 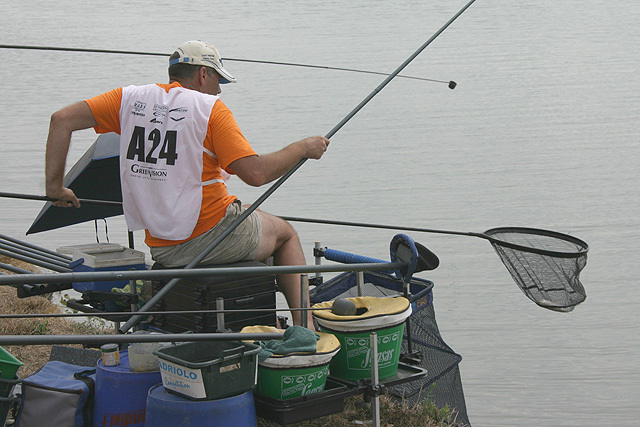 With a total fish count of 634, France recorded the 4th highest of the tournament. But their 23rd position said it all! 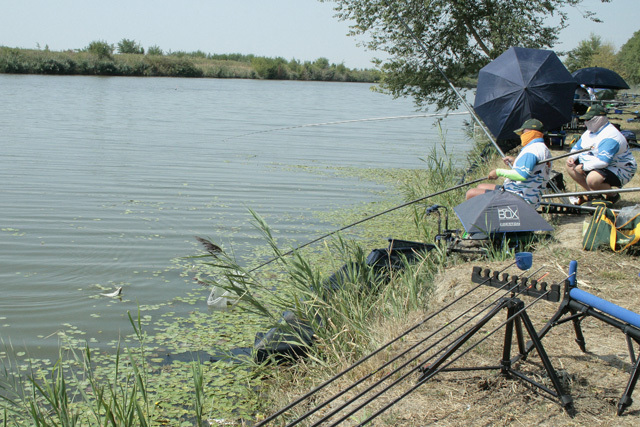 Until they attitude to catching better fish at these tournaments, I fear they will never aspire to those 'Golden Years' of the 60's and 70's, which is a shame for such a country with a proud and illustrious history! 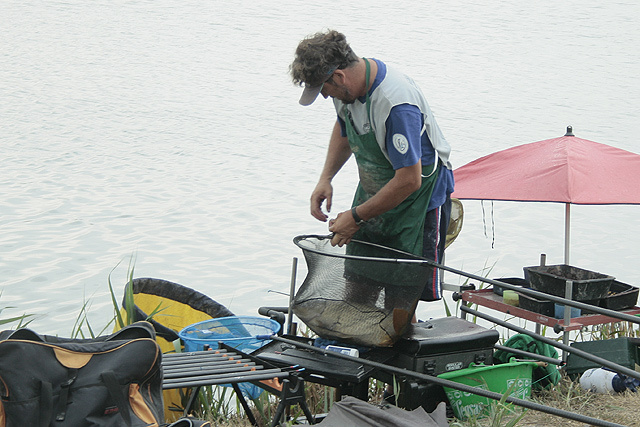 Frenchman Stephane Pottelet nets another small fish from D24. 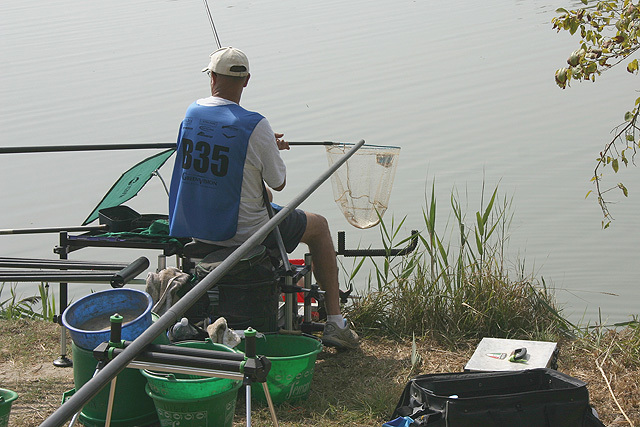 With a total fish count of 634, France recorded the 4th highest of the tournament. But their 23rd position said it all! 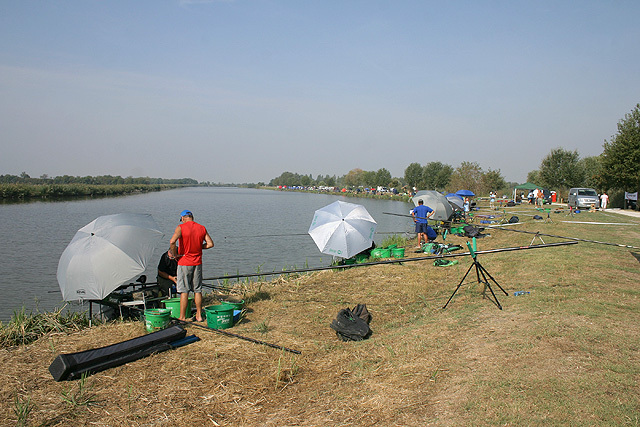 Until they attitude to catching better fish at these tournaments, I fear they will never aspire to those 'Golden Years' of the 60's and 70's, which is a shame for such a country with a proud and illustrious history! 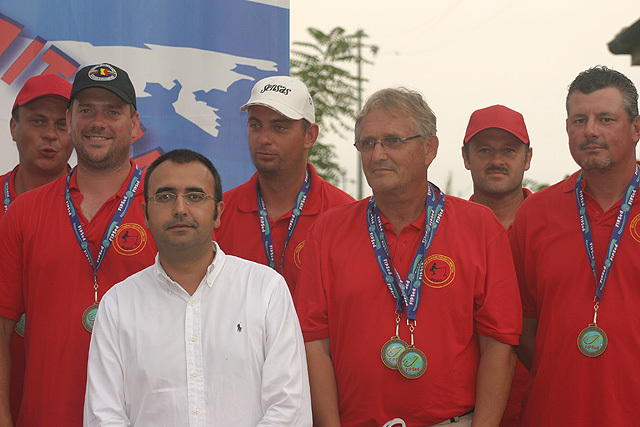 One of the world's emerging nations in angling, Russia, have many anglers capable of giving their country podium honours. Here we have one of their newer recruits, Boris Vyacheslav playing a cood fish on D27. 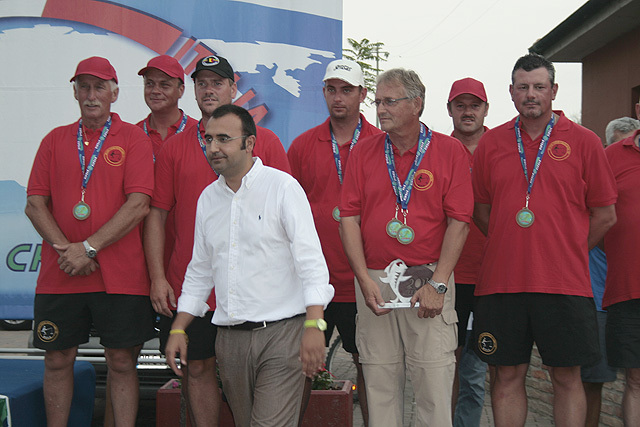 One of the world's emerging nations in angling, Russia, have many anglers capable of giving their country podium honours. Here we have one of their newer recruits, Boris Vyacheslav playing a cood fish on D27. It looks like a bream of around a kilo, which would help Boris to a 7th in sector with a weight of 6,840kgs and an overall 36th individual placing. It looks like a bream of around a kilo, which would help Boris to a 7th in sector with a weight of 6,840kgs and an overall 36th individual placing. 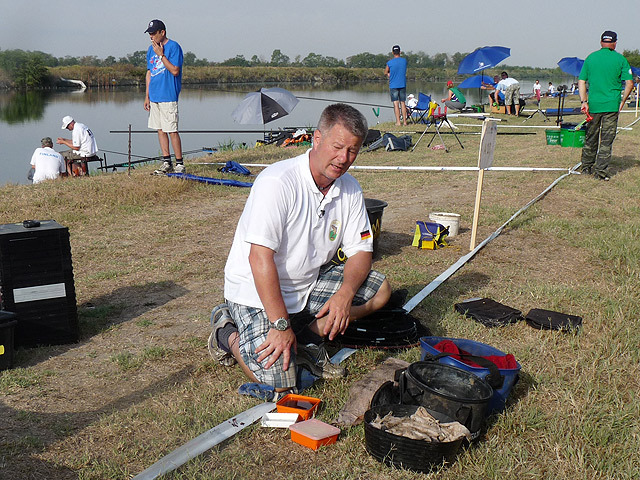 This was not a good tournament for many of the German team, especially one of their stars, former European Champion Gunter Horler on E25. Here he has his Italian-minder, Vincenzo Natale checking up on him. Gunter's final sector position of 12th place, dropped him well out of contention. This was not a good tournament for many of the German team, especially one of their stars, former European Champion Gunter Horler on E25. Here he has his Italian-minder, Vincenzo Natale checking up on him. Gunter's final sector position of 12th place, dropped him well out of contention. and a reasonable skimmer to boost his weight to 8,250kgs and 6 sector points, a big improvement on his day one 16pts. and a reasonable skimmer to boost his weight to 8,250kgs and 6 sector points, a big improvement on his day one 16pts. Finland's Seppo Ponni with a good-looking skimmer from E32. 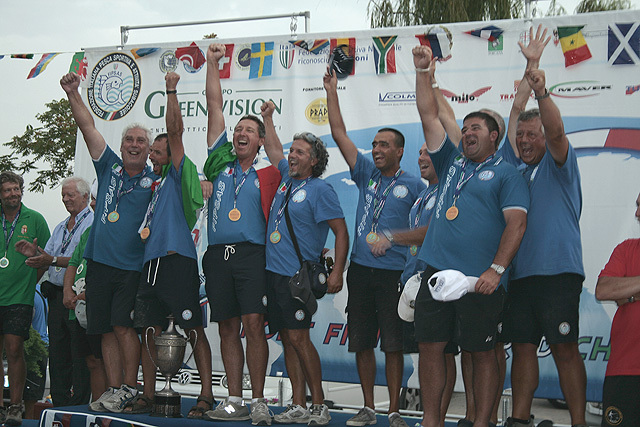 His team always have a separate competition during these championships with their Scandinavian neighbours and this year took the honours quite comfortably from Sweden and Denmark. Absent were Norway. Finland's Seppo Ponni with a good-looking skimmer from E32. 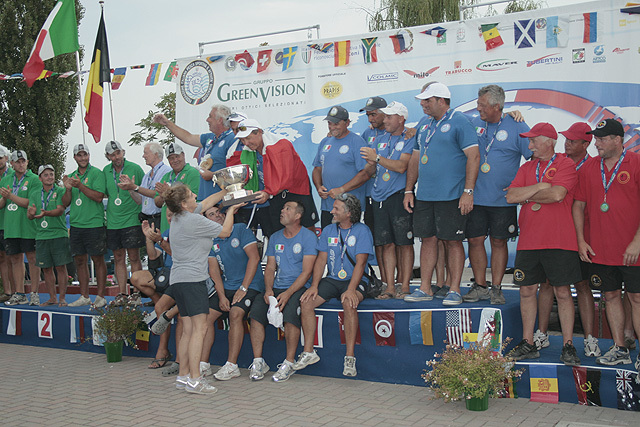 His team always have a separate competition during these championships with their Scandinavian neighbours and this year took the honours quite comfortably from Sweden and Denmark. Absent were Norway. The Ukraine's Sergiy Veremeychuk plays a good fish on E33. The Ukraine's Sergiy Veremeychuk plays a good fish on E33. Sergiy was his country's star performer, posting a final sector win here with 13,640kgs. Ukraine, like their more accomplished neighbour Russia, are beginning to establish themselves more in these international events. Sergiy was his country's star performer, posting a final sector win here with 13,640kgs. Ukraine, like their more accomplished neighbour Russia, are beginning to establish themselves more in these international events. 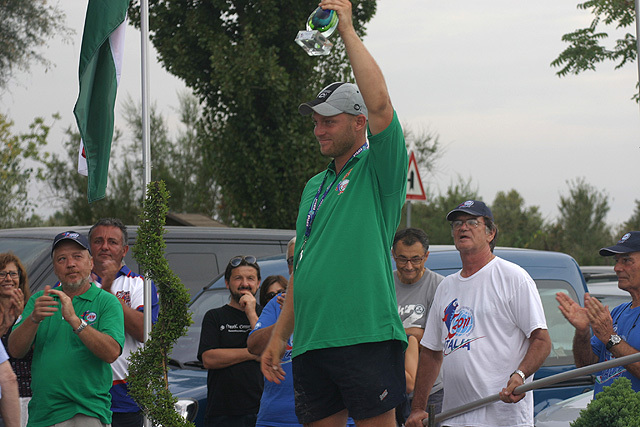 Jo Adriolo's 10,770kgs catch was overtaken by both the Italian and Hungarian in his sector. 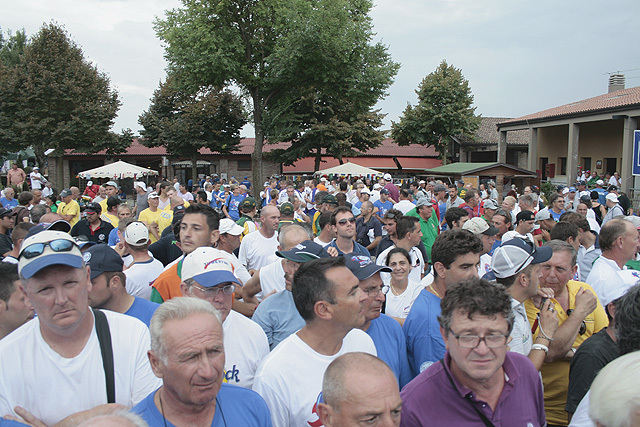 Jo Adriolo's 10,770kgs catch was overtaken by both the Italian and Hungarian in his sector. 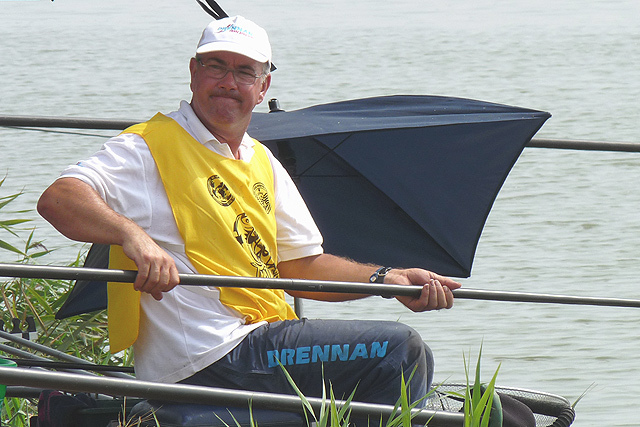 Ukraine's Sergiy Burdak, who sometimes doubles up as a Russian coach, with a couple of quality bream from D4 which gave him 9,660kgs and 5pts for his team. 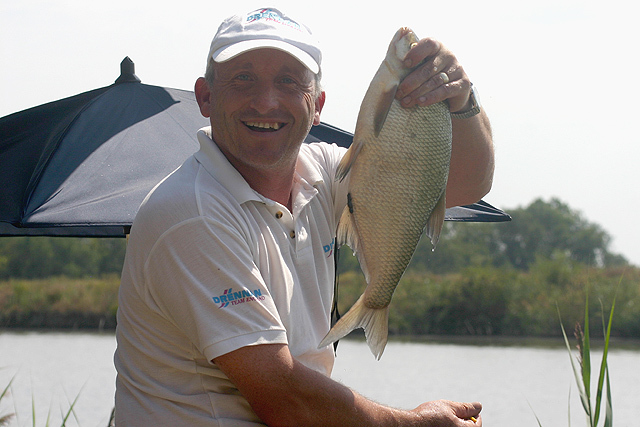 Ukraine's Sergiy Burdak, who sometimes doubles up as a Russian coach, with a couple of quality bream from D4 which gave him 9,660kgs and 5pts for his team. 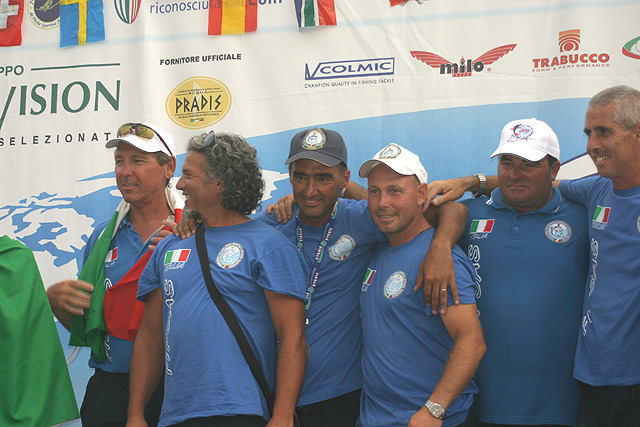 Ferruccio Gabba is joined by one of the Italian coaching staff. 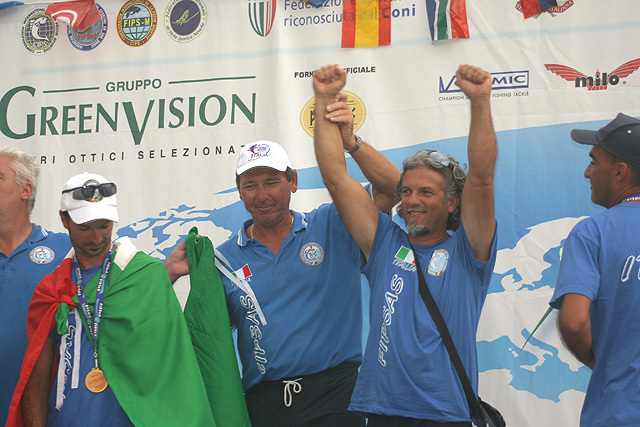 Ferruccio Gabba is joined by one of the Italian coaching staff. which gave him a sector win for an individual bronze medal. 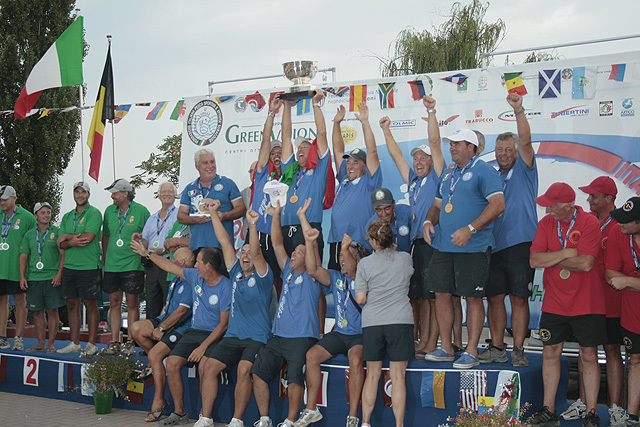 It was a remarkable championship in as much as all the top three finished with equal points and were only separated on the podium by a few kilo's of fish! which gave him a sector win for an individual bronze medal. 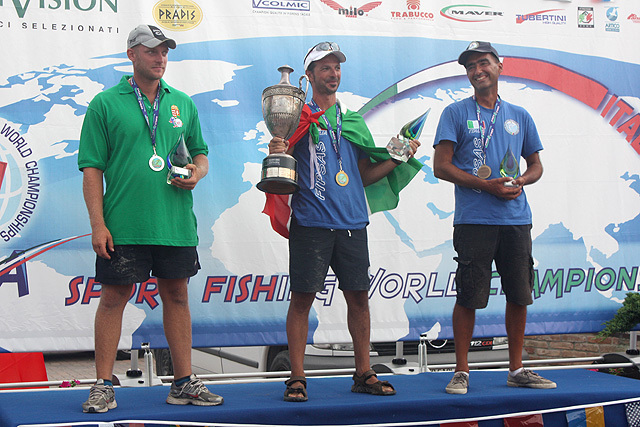 It was a remarkable championship in as much as all the top three finished with equal points and were only separated on the podium by a few kilo's of fish! Spain's top angler of the championship, Mario Mateos Doncel, with a 5 kilo plus carp which helped him to a 6th in sector off D10. Spain, like France, couldn't convert their Euro form during this world event and had to settle for a disappointing 25th place. Spain's top angler of the championship, Mario Mateos Doncel, with a 5 kilo plus carp which helped him to a 6th in sector off D10. Spain, like France, couldn't convert their Euro form during this world event and had to settle for a disappointing 25th place. 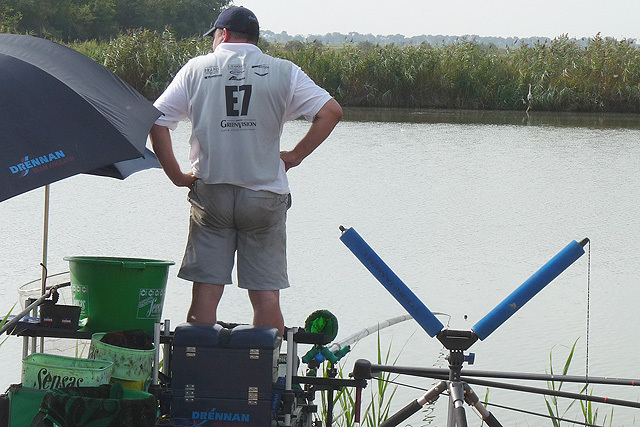 England's historic individual champion, Alan Scotthorne on D26, found a Serb at the end of the sector too good for his 9,360kgs catch... but only by half a kilo! 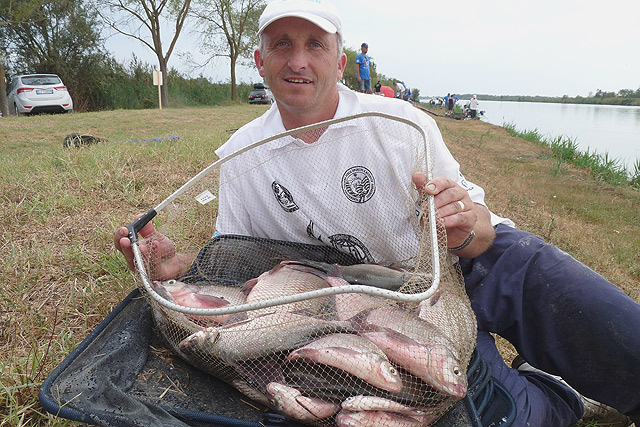 England's historic individual champion, Alan Scotthorne on D26, found a Serb at the end of the sector too good for his 9,360kgs catch... but only by half a kilo! Perhaps the fish of the match, and captured by someone noted for his bream fishing as well! 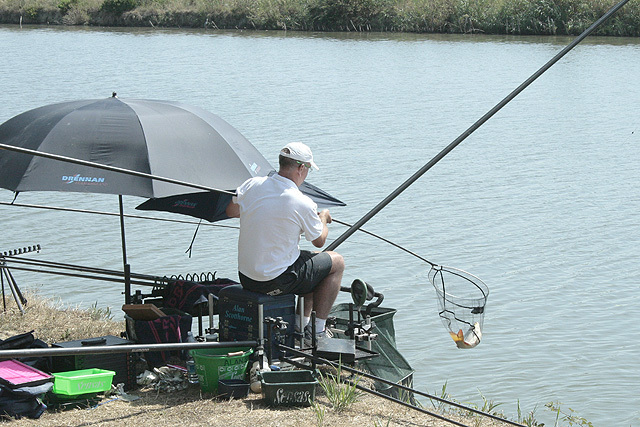 Perhaps the fish of the match, and captured by someone noted for his bream fishing as well! 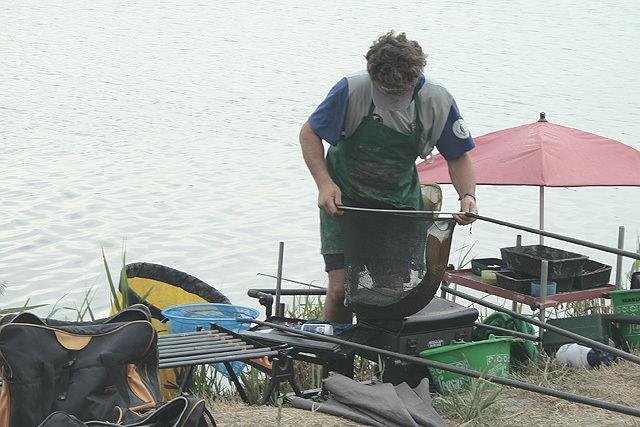 Belgium's Guido Nullens is renown throughout Europe for his angling abilities, especially were bream are concerned. 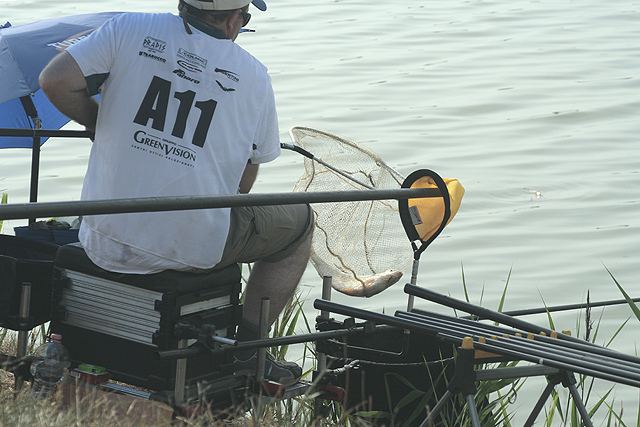 Even so, this 10kg+ monster was more than a welcome intruder into his E2 peg, as it secured him the sector win and undoubtadly gave his team their podium position, for without it he would have been propping up the sector behind Holland and England! 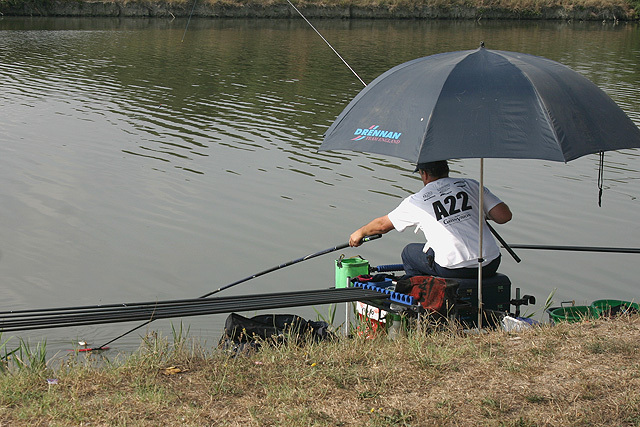 Belgium's Guido Nullens is renown throughout Europe for his angling abilities, especially were bream are concerned. 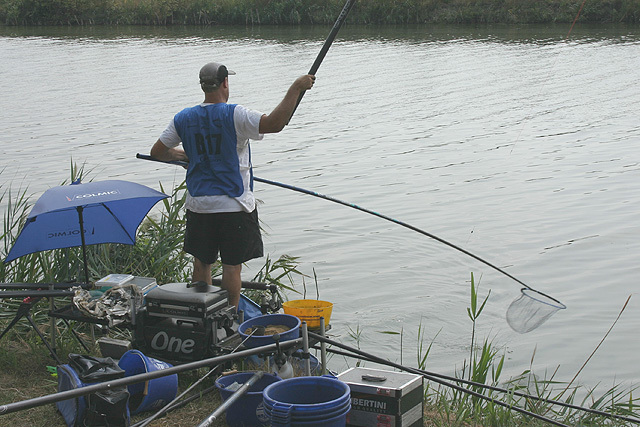 Even so, this 10kg+ monster was more than a welcome intruder into his E2 peg, as it secured him the sector win and undoubtadly gave his team their podium position, for without it he would have been propping up the sector behind Holland and England! but he did find a better prospect of getting his hands on a medal after the final whistle when Holland's new Ladies World Champion, Ingeborg Audenaerd, joined him!!! but he did find a better prospect of getting his hands on a medal after the final whistle when Holland's new Ladies World Champion, Ingeborg Audenaerd, joined him!!! A rather large Serb catches a rather large carp! Goran's hanging on to a big one! Goran's hanging on to a big one! but he cannot quite get it in as the fish decides to move off! but he cannot quite get it in as the fish decides to move off! only to see that the fish has other ideas of where it wants to go and powers away once more. only to see that the fish has other ideas of where it wants to go and powers away once more. and this time looks as though he may be in luck! and this time looks as though he may be in luck! 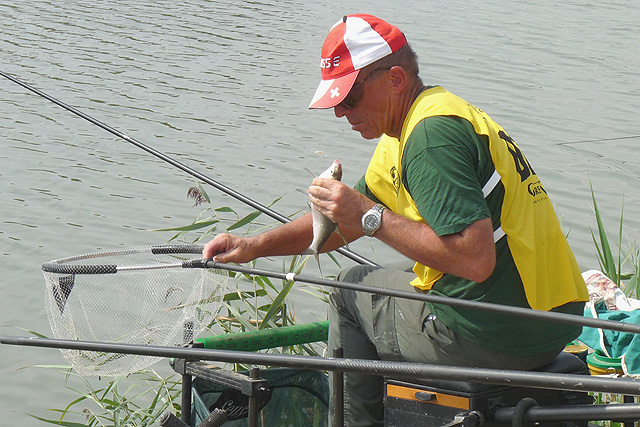 and now comes the tricky part of lifting the fish clear of the water... remember that South African Adrians Van Der Heever lost his monster fish at this stage on day one!!! 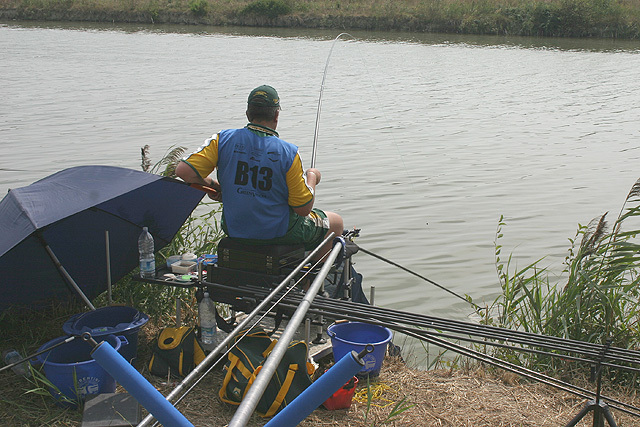 and now comes the tricky part of lifting the fish clear of the water... remember that South African Adrians Van Der Heever lost his monster fish at this stage on day one!!! It's all clear now and Goran's manager comes down to congratulate him. We then thought he told Goran to go back out and get another one, as he was only lying in about 4th place!!!! It's all clear now and Goran's manager comes down to congratulate him. We then thought he told Goran to go back out and get another one, as he was only lying in about 4th place!!!! but that landing net doesn't look to solid to us! 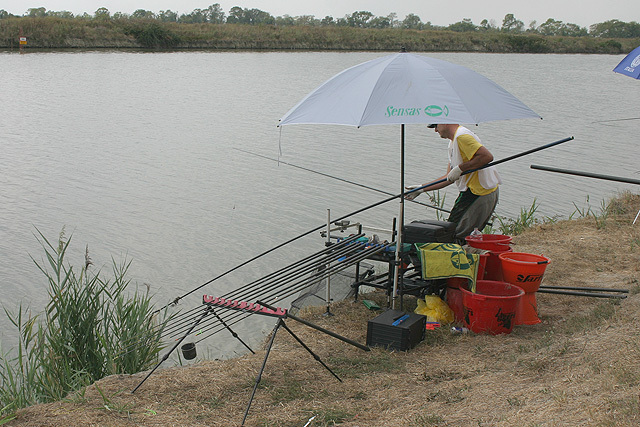 but that landing net doesn't look to solid to us! 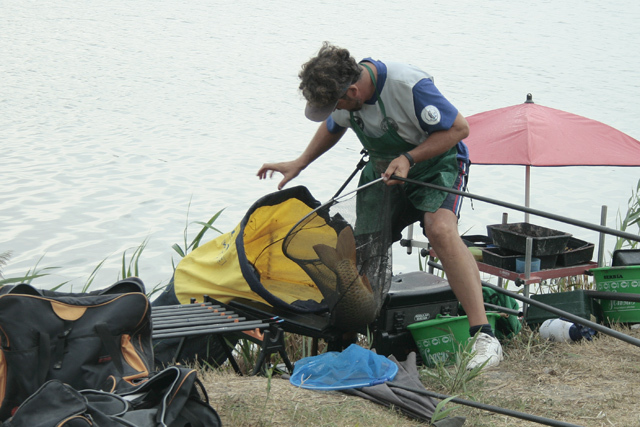 As Goran tries to fit the heavyweight carp into the mouth of the keepnet, the landing nets joint starts to creak under the massive fish. 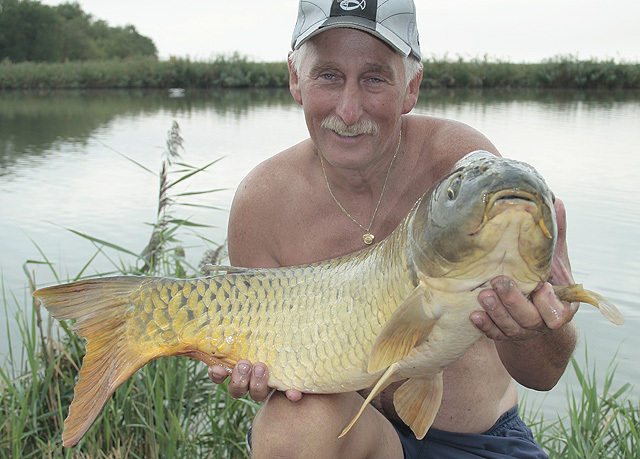 'Mr Barbel', sorry he's now been re-classified as 'Mr Carp', will have to be careful! 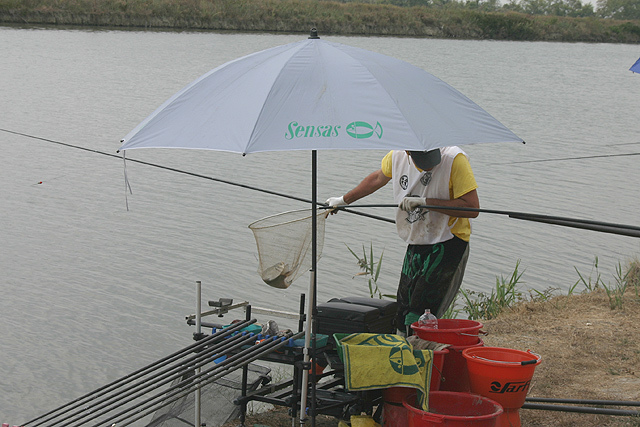 As Goran tries to fit the heavyweight carp into the mouth of the keepnet, the landing nets joint starts to creak under the massive fish. 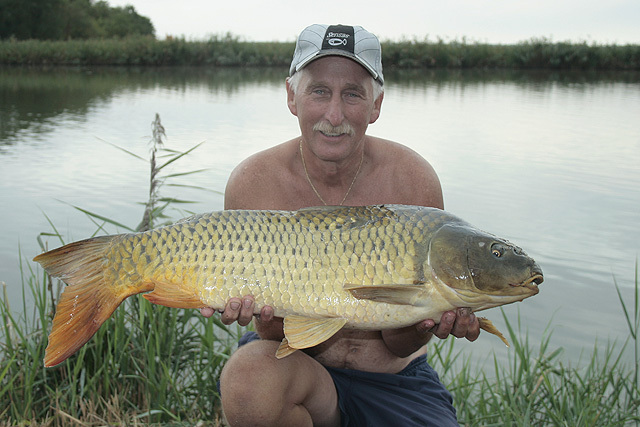 'Mr Barbel', sorry he's now been re-classified as 'Mr Carp', will have to be careful! At last the precious cargo is deposited into the landing net and Goran can breath a sigh of relief as that fish has just shot him to the top part of the section! At last the precious cargo is deposited into the landing net and Goran can breath a sigh of relief as that fish has just shot him to the top part of the section! The following galleries revolve around the individual champion and winning team before, during and after the presentation ceremony. much to the appreciation of his close friend Jacopo! much to the appreciation of his close friend Jacopo! They really are good buddies... at least I hope they are!!! They really are good buddies... at least I hope they are!!! Without this person, FIPS and Claudio would probably cease to function, and special mention was made of this during the awards ceremony, which drew another emotional response! Without her FIPS would probably grind to a halt! Without her FIPS would probably grind to a halt! Special mention was given at the awards to her and she was overcome with emotion...that and her favourite team winning of course! Special mention was given at the awards to her and she was overcome with emotion...that and her favourite team winning of course! But she had a friend close by to tell her it was deserved praise. But she had a friend close by to tell her it was deserved praise. They even laughed about it! They even laughed about it! And then someone got her going again!!! And then someone got her going again!!! This young man was over the moon when he knew he had become the 2011 World Champion! and a photo call with even more special friends! and a photo call with even more special friends! where he receives an embrace from his friend and team mate Ferruccio Gabba. where he receives an embrace from his friend and team mate Ferruccio Gabba. Andrea kneels to receive his medal from Claudio, as he he quite short, Claudio that is! Andrea kneels to receive his medal from Claudio, as he he quite short, Claudio that is! A proud moment for the young Italian. A proud moment for the young Italian. And and even better moment when Barbara presents him with his special trophy! And and even better moment when Barbara presents him with his special trophy! We must not forget also the two other competitors who took the individual outcome to the 'wire'. 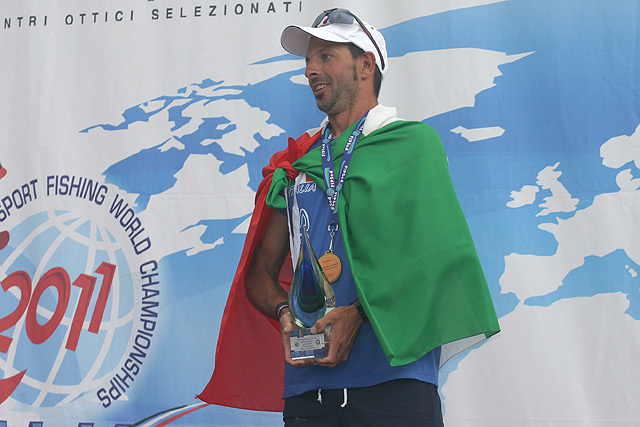 Ferruccio Gabba, bronze medallist. 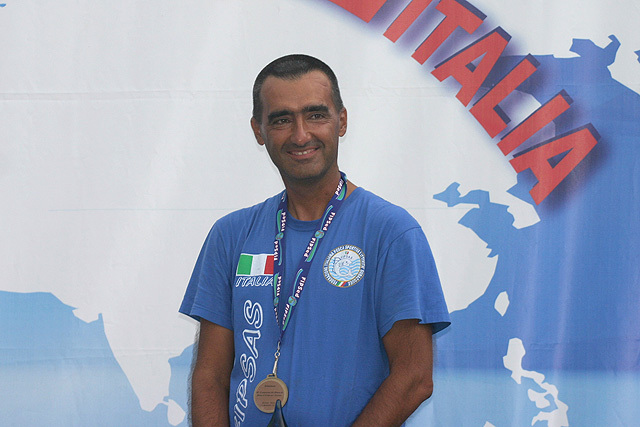 Ferruccio Gabba, bronze medallist. 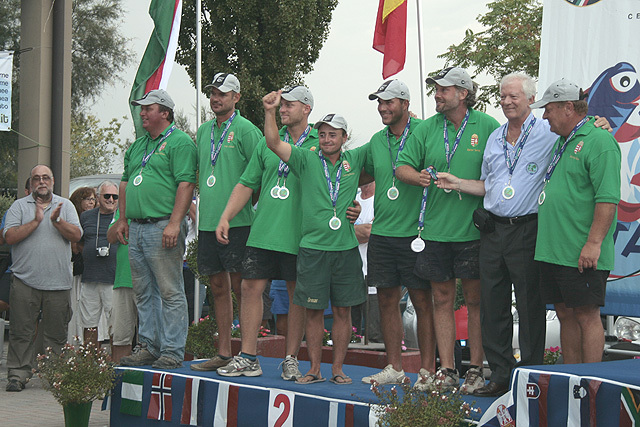 Ferruccio received his medal and trophy from FIPS official and Welsh team manager, Eric Humphries. 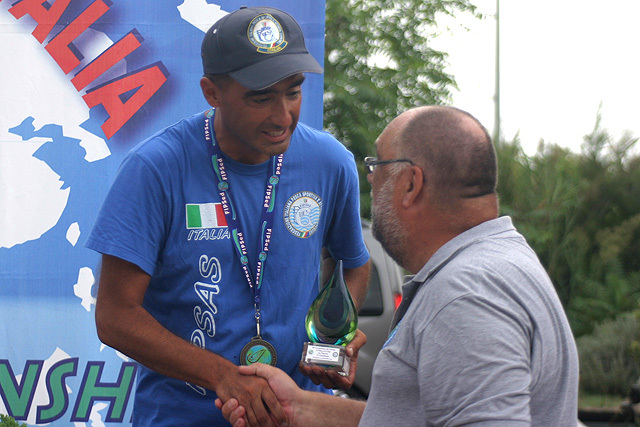 Ferruccio received his medal and trophy from FIPS official and Welsh team manager, Eric Humphries. Hungary's Peter Milkovics salutes the crowd on receiving his silver medal and trophy. Hungary's Peter Milkovics salutes the crowd on receiving his silver medal and trophy. What will the Czech Republic have in store these three next year I wonder? What will the Czech Republic have in store these three next year I wonder? But the Nations Championship is first and foremost about a team. And this year saw the world's top five teams all compete for the top five places. 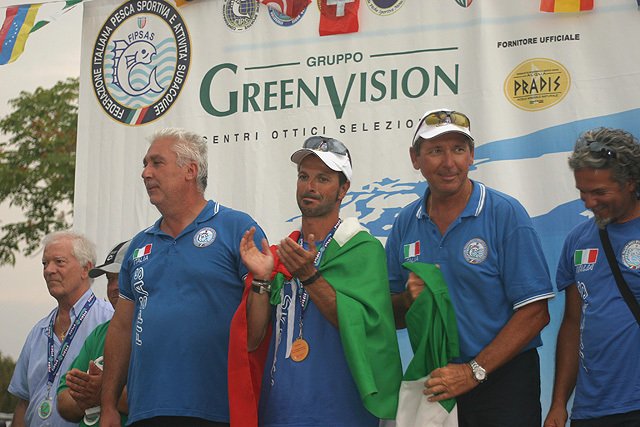 Unfortunately the other four teams could not all take podiums positions, but two of them could join Italy there. presented by one of the Italian Federation officials we think. presented by one of the Italian Federation officials we think. 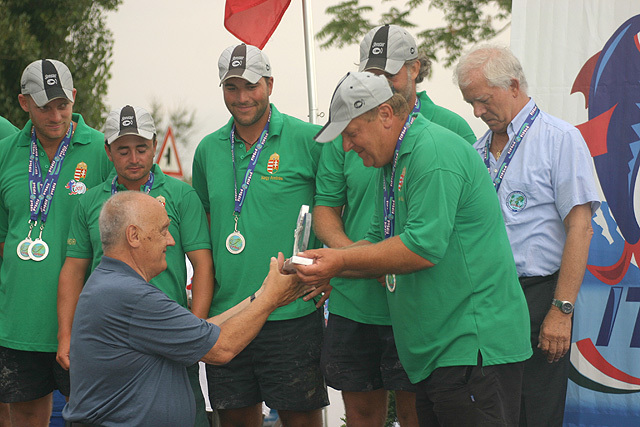 FIPS Technical Director and Belgian team manager, Roland Marcq, accepts the teams Bronze trophy from the towns official (Mayor I think!). 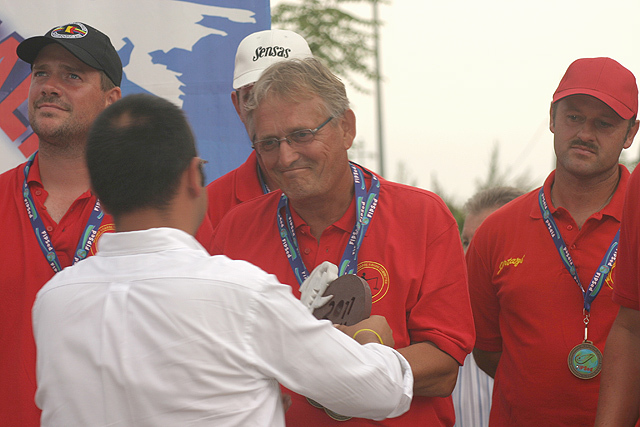 FIPS Technical Director and Belgian team manager, Roland Marcq, accepts the teams Bronze trophy from the towns official (Mayor I think!). And remains while their national anthem plays. And remains while their national anthem plays. Consistency is one of Belgium's strong points...they also finished in the same position on the Euros! Consistency is one of Belgium's strong points...they also finished in the same position on the Euros! 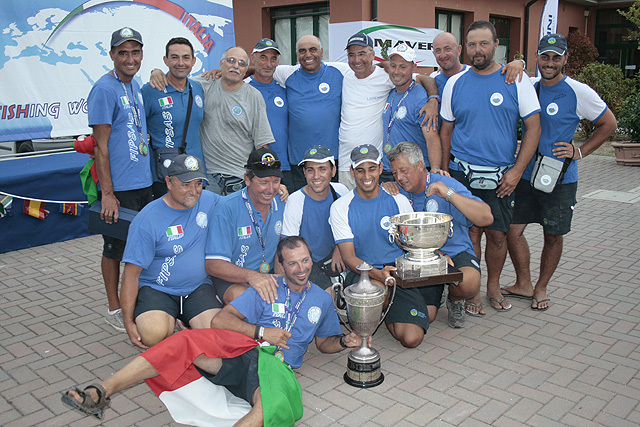 If anyone knows how to celebrate victory, then an Italian does...and this team did not disappoint in a Championship where losing was not an option for them! 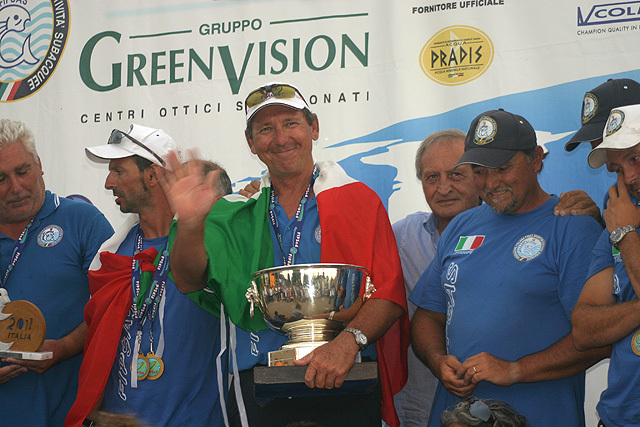 where team manager Rodolfo (Rudy) Frigeri acknowledges the applause of the crowd. 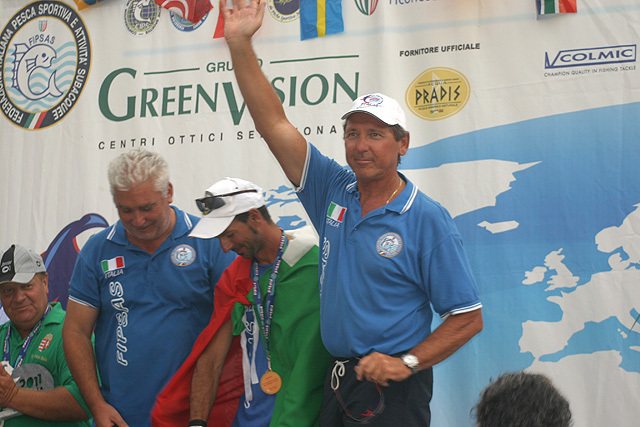 where team manager Rodolfo (Rudy) Frigeri acknowledges the applause of the crowd. The next few photos are of the team celebrating on the podium and need no captions. The next few photos are of the team celebrating on the podium and need no captions. as Barbara does the rounds! as Barbara does the rounds! Probably my favourite photo of the team, Rudy waving to us. It says it all! Probably my favourite photo of the team, Rudy waving to us. It says it all! 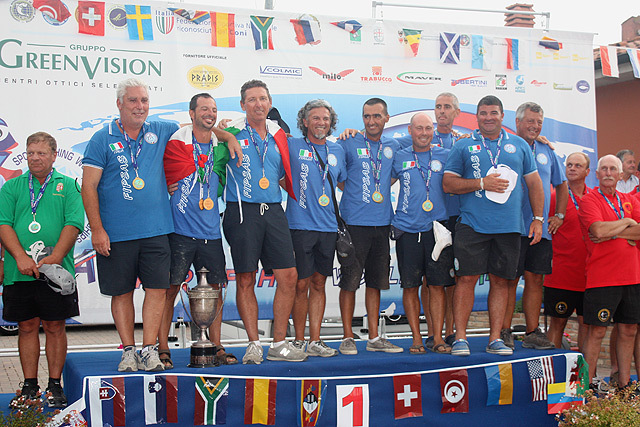 An inpromptu gathering of the winning team after the official presentations...but someone important is missing! 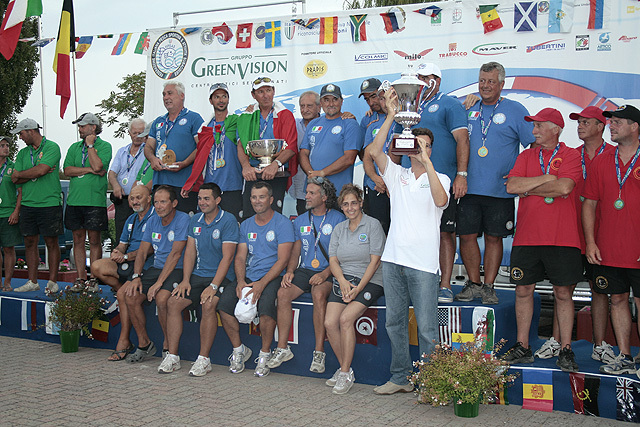 An inpromptu gathering of the winning team after the official presentations...but someone important is missing! It's OK, he's finally arrived! Good job you are not wearing a skirt Andrea!!! It's OK, he's finally arrived! Good job you are not wearing a skirt Andrea!!! And finally, some little extras our camera's caught which you may find amusing and interesting. The crowd patiently waits for the presentation ceremony to begin. The crowd patiently waits for the presentation ceremony to begin. Two trophies, on the left, and somewhat tarnished, is the individual and on the right perhaps the trophy that the winning team keeps? Hope Andrea gives that cup a good clean when he gets home! 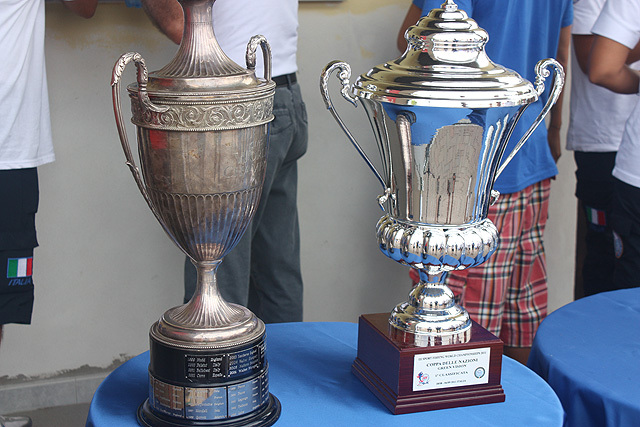 Two trophies, on the left, and somewhat tarnished, is the individual and on the right perhaps the trophy that the winning team keeps? Hope Andrea gives that cup a good clean when he gets home! 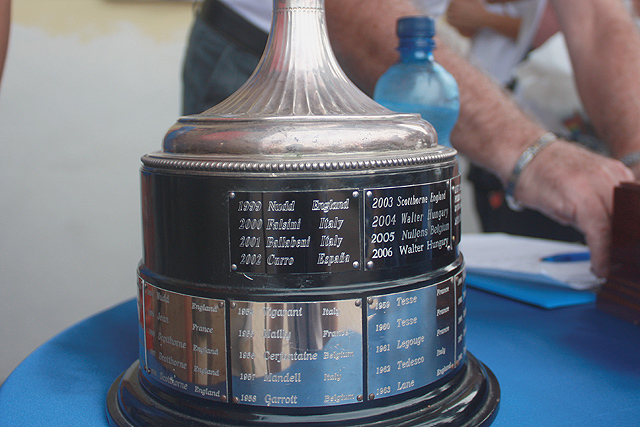 But this is the prize every nation on the planet wants... the coveted Team Trophy, which was presented to the World Angling body by England's National Federation of Anglers back in 1981. 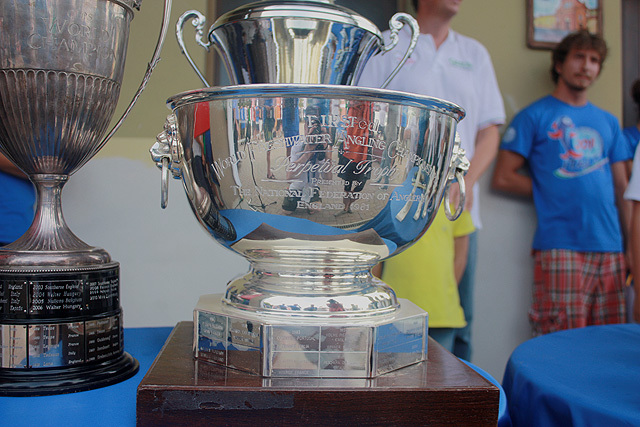 But this is the prize every nation on the planet wants... the coveted Team Trophy, which was presented to the World Angling body by England's National Federation of Anglers back in 1981. 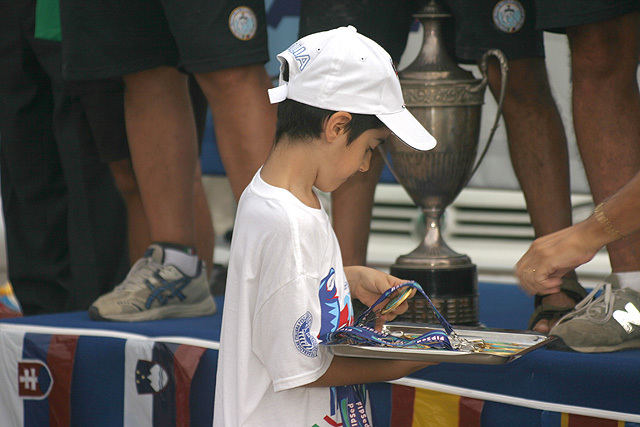 A nice touch during the presentation was the use of this young gentleman to bring forth the winning teams medals. Something he will no doubt remember in later years! A nice touch during the presentation was the use of this young gentleman to bring forth the winning teams medals. Something he will no doubt remember in later years! There'd always someone who goes over the top at these occasions. In this case quite literally over the top of his head! I wonder if he will wash those autographs off when he showers, or will he perhaps wear a shower cap? There'd always someone who goes over the top at these occasions. In this case quite literally over the top of his head! 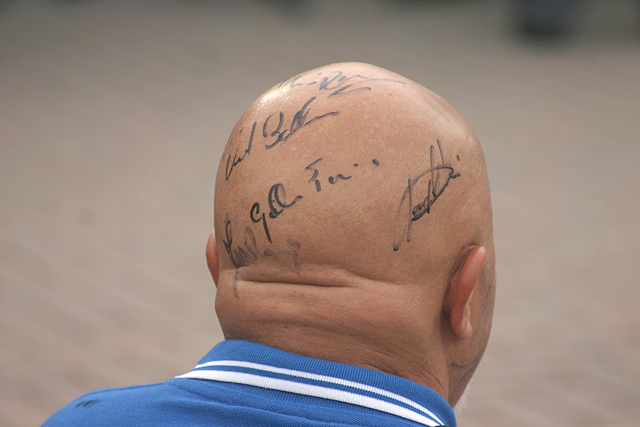 I wonder if he will wash those autographs off when he showers, or will he perhaps wear a shower cap? Our thanks go to our partner website in Germany, Champions-team, for their cooperation in supplying pictures from places my humble self could not get to!